Berlin, like many others, is a city of stickers. 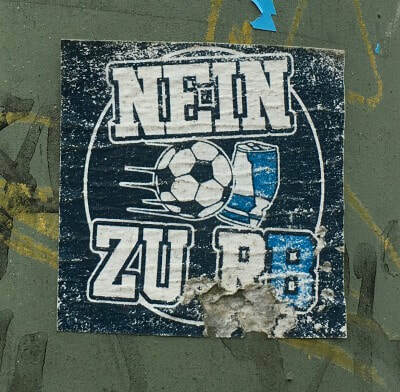 ​In some cities you will find very few of these totems of popular football culture and yet in others they thrive. 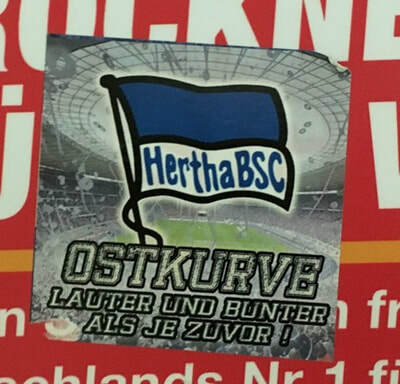 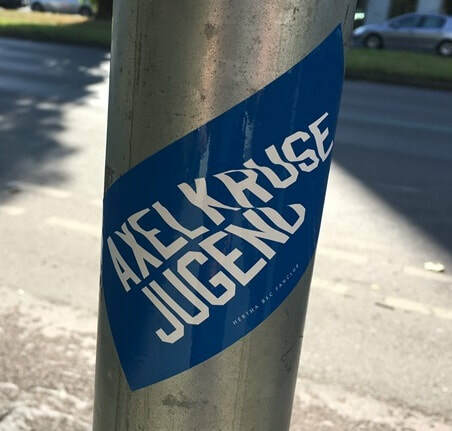 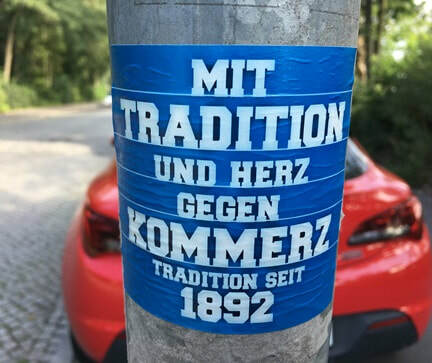 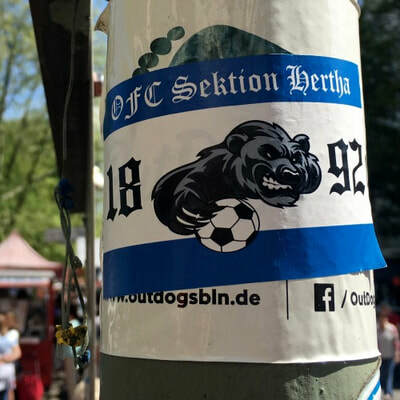 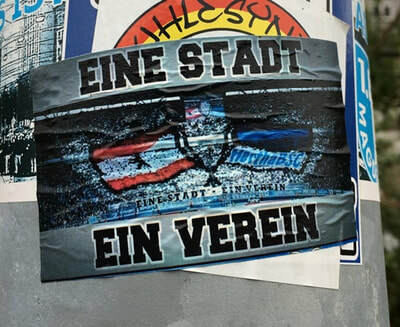 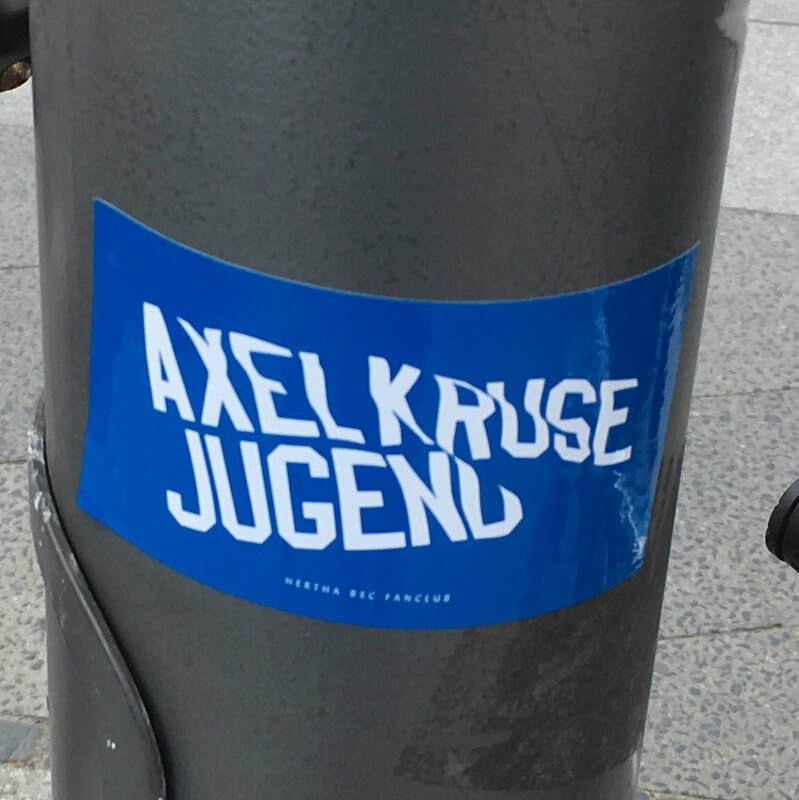 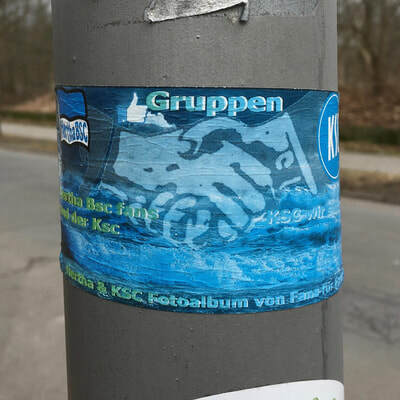 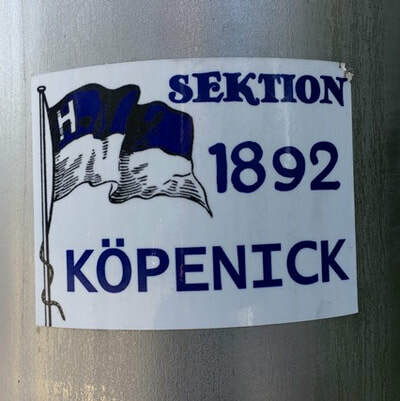 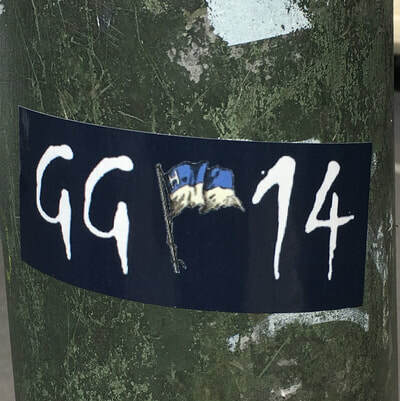 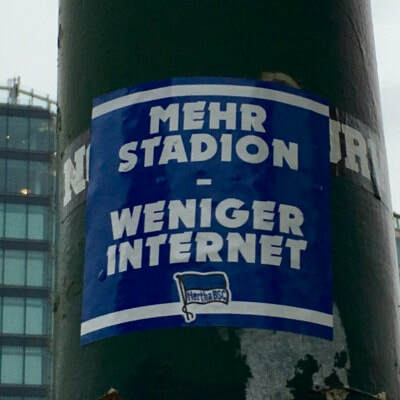 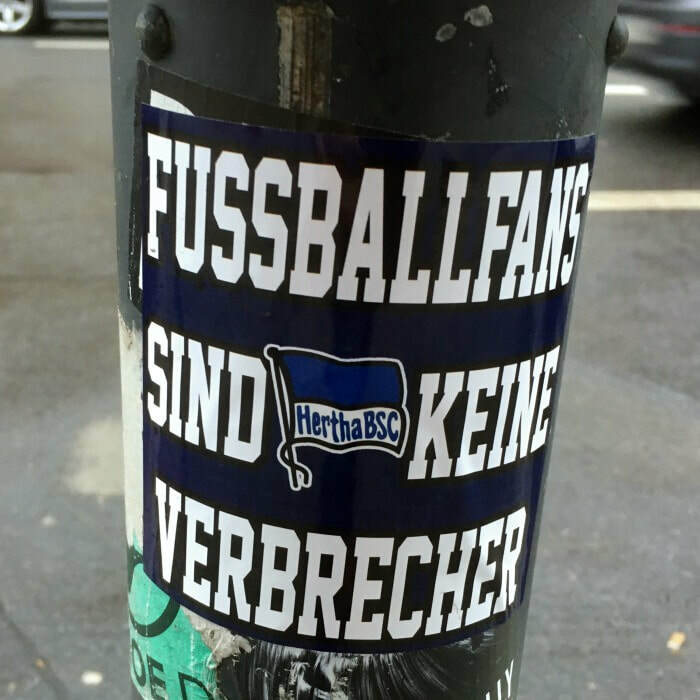 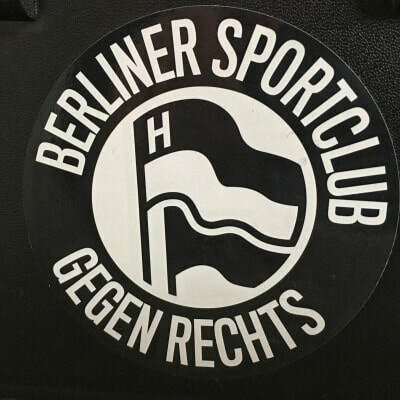 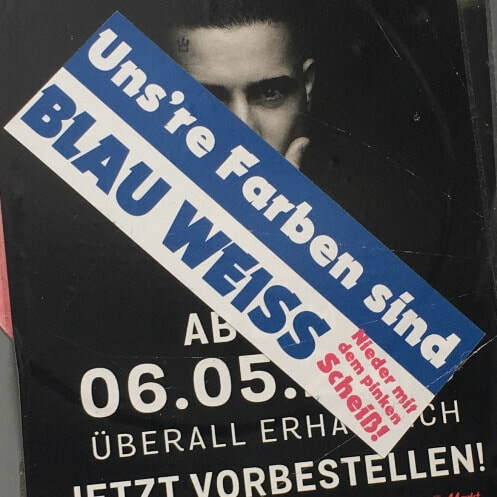 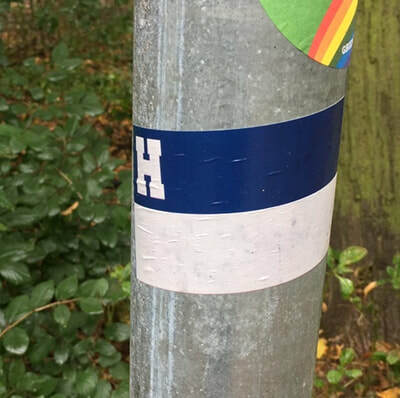 In the Hertha fan scene there is a tribalism in placing stickers and in doing so fans marking territory in competition with rival fan groups. 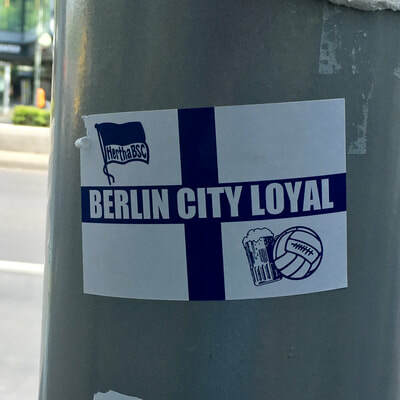 This is part of the fan culture in Berlin like many cities. 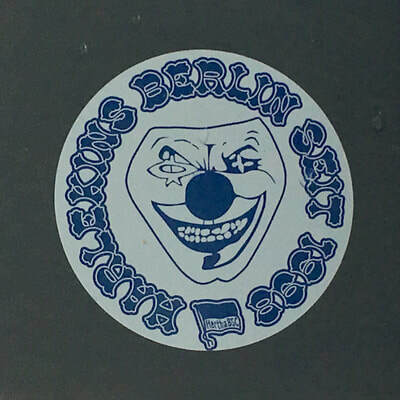 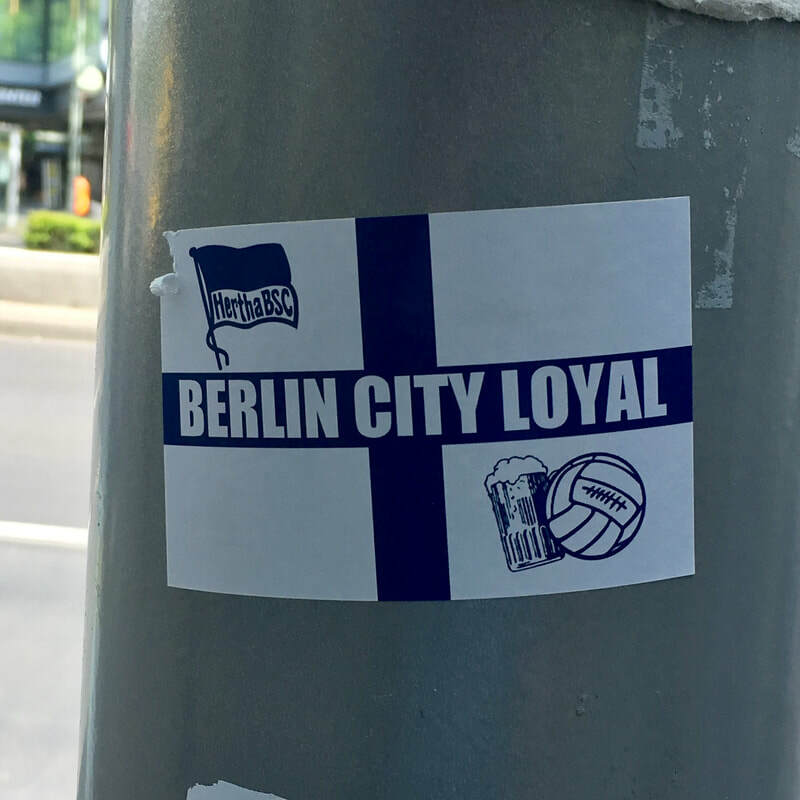 The variety of stickers seen on road signs and lamp posts whilst wandering the streets of Berlin is truly astounding. 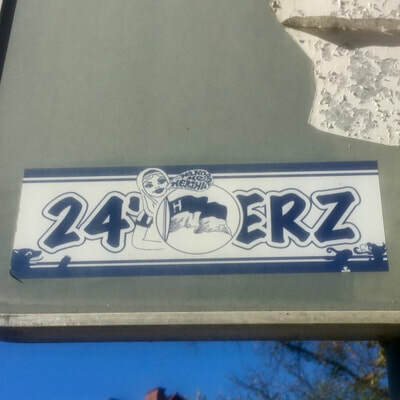 Naturally some districts have more than others. You'll find many in Kreuzberg but perhaps not so many in Dahlem. 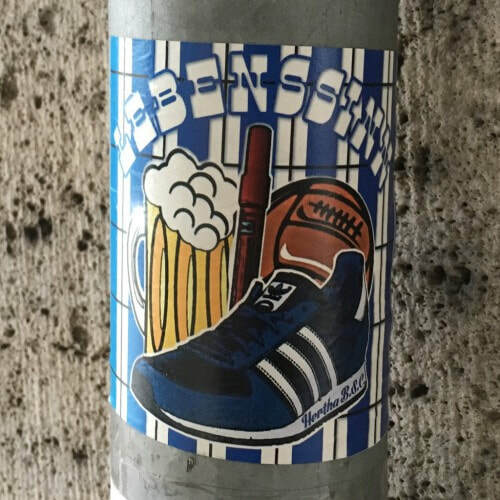 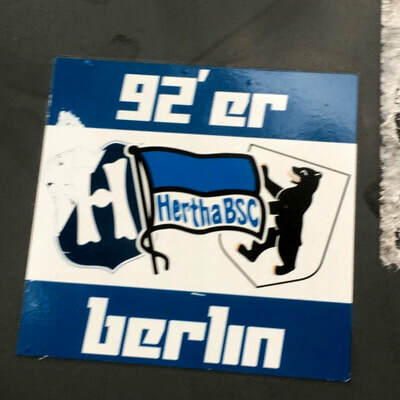 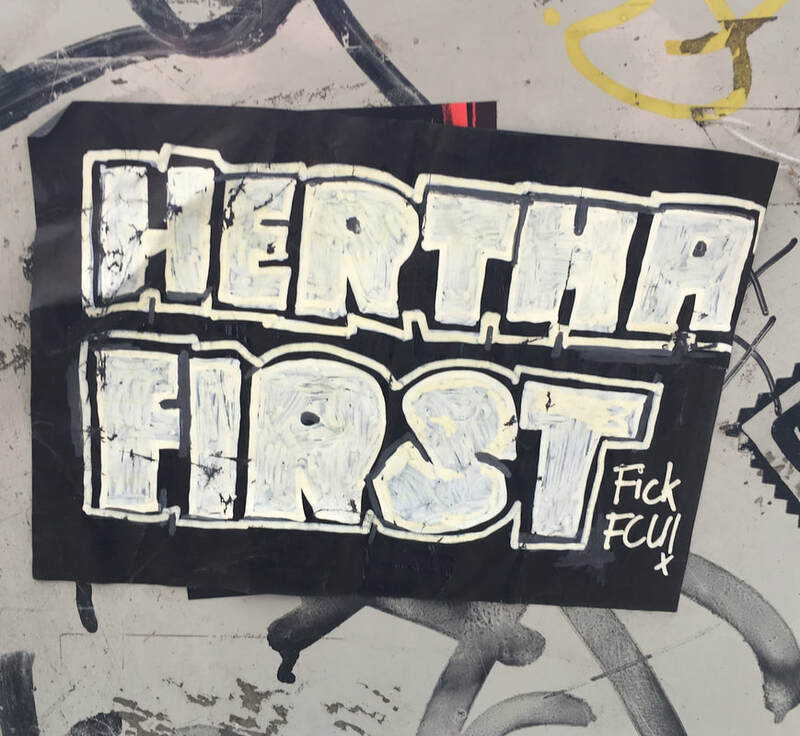 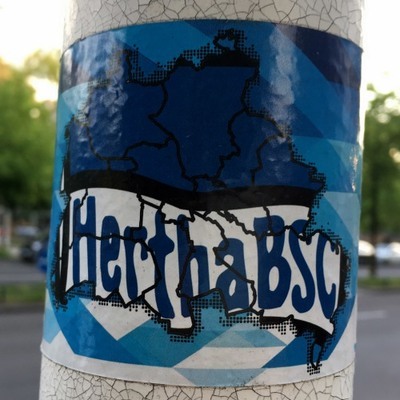 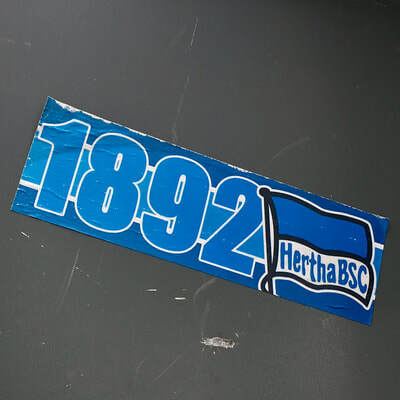 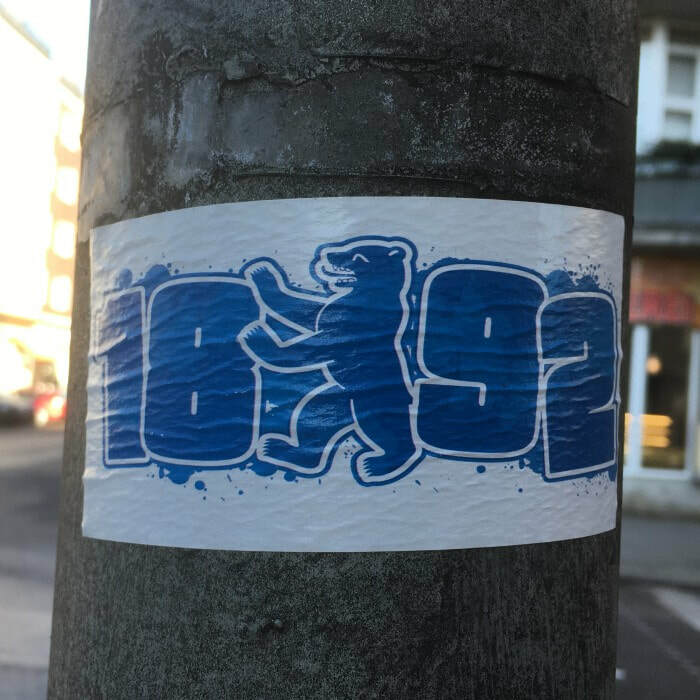 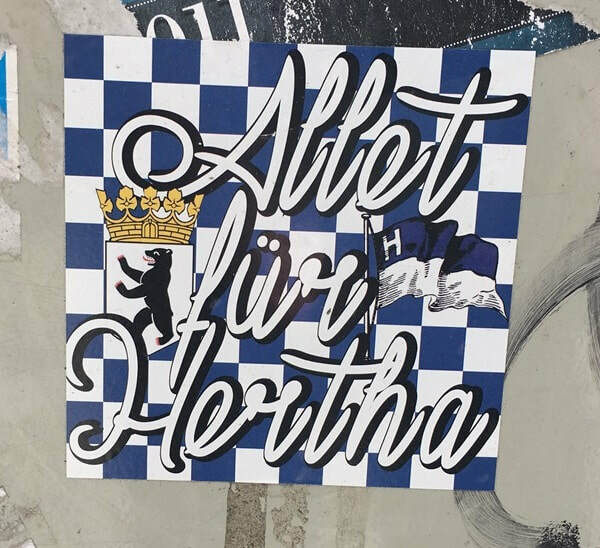 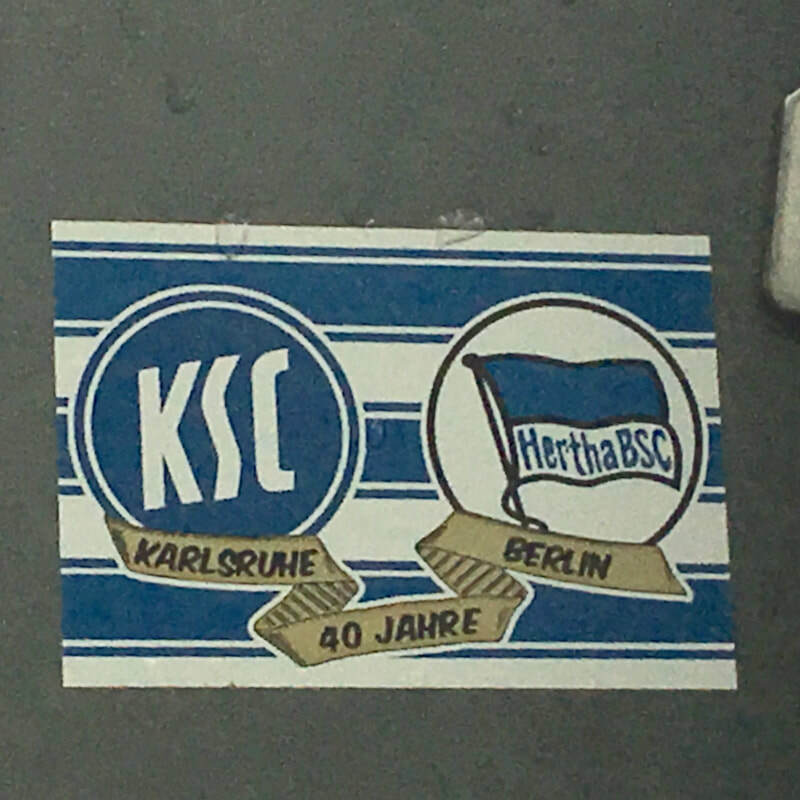 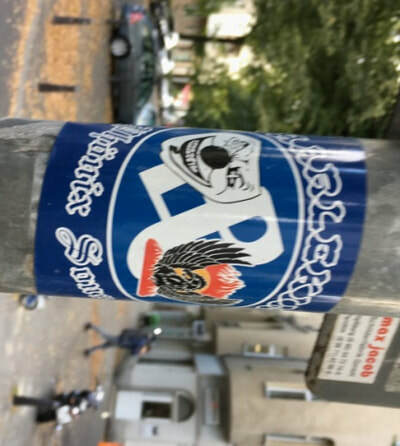 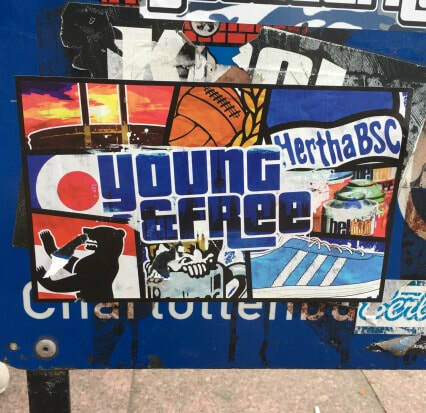 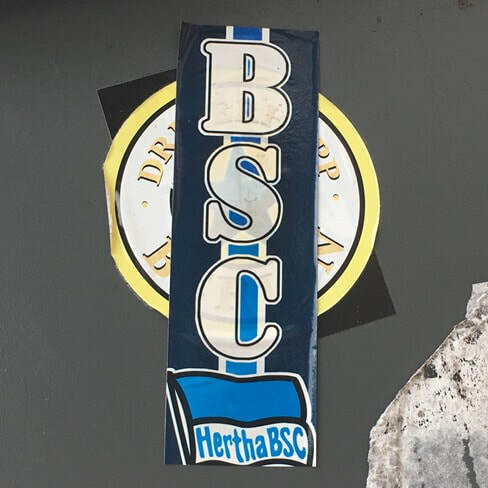 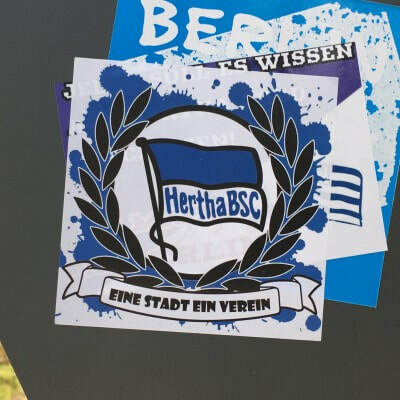 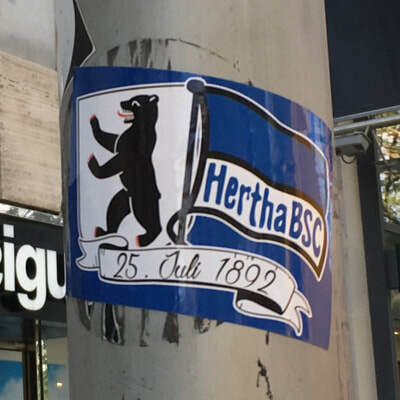 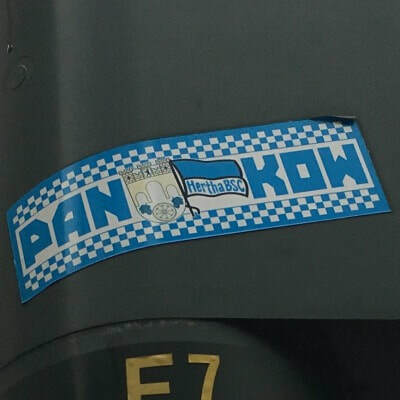 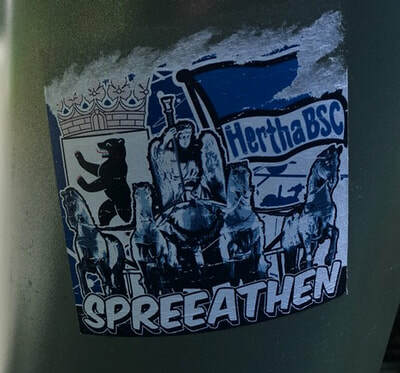 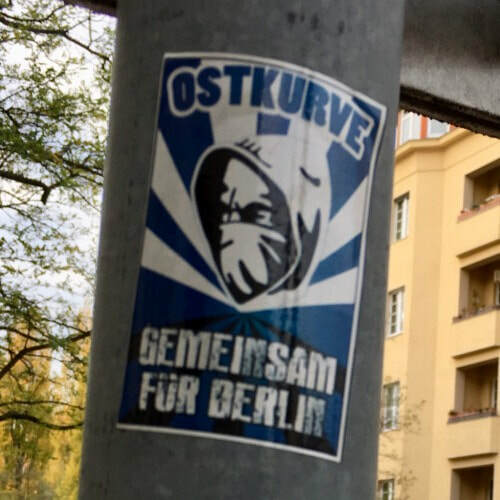 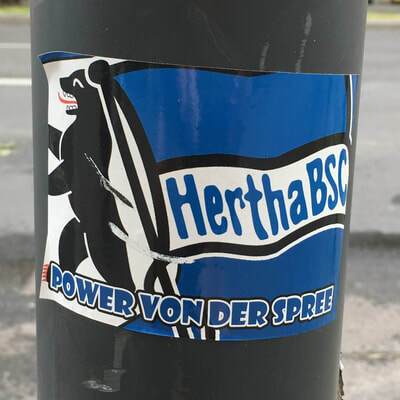 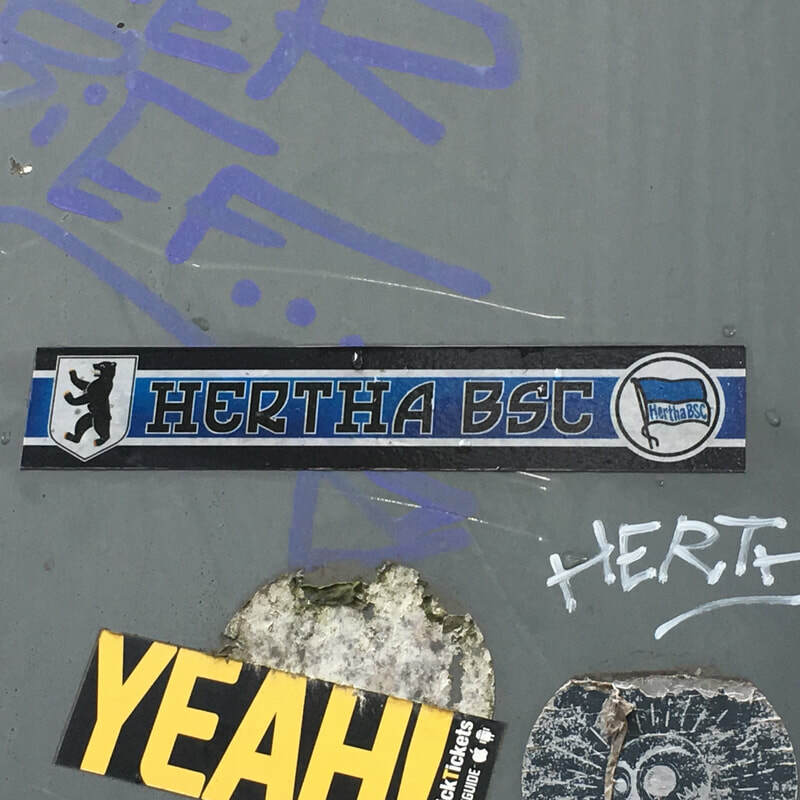 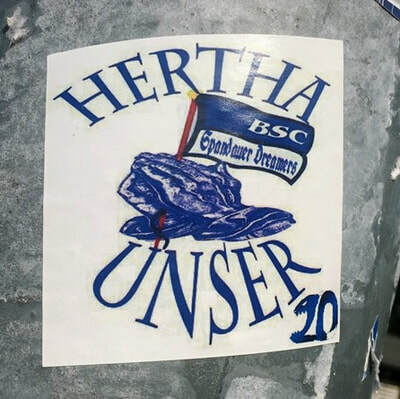 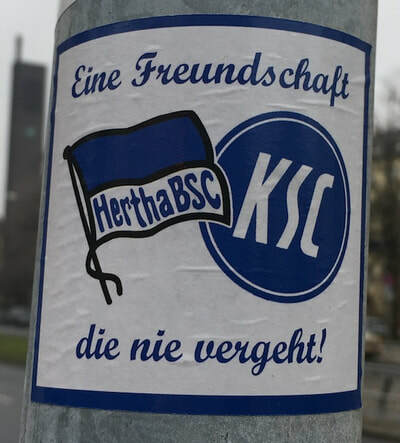 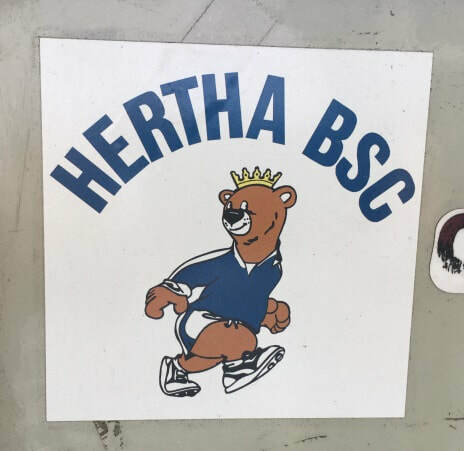 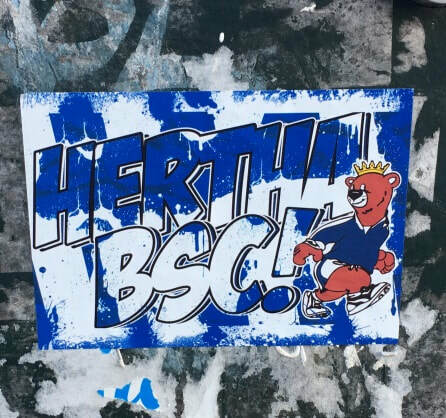 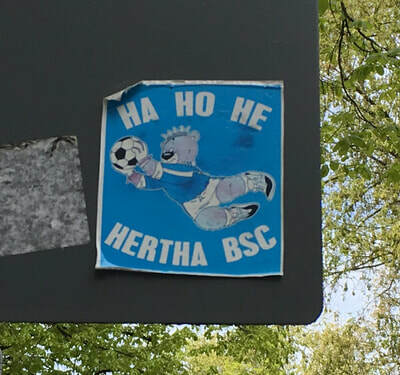 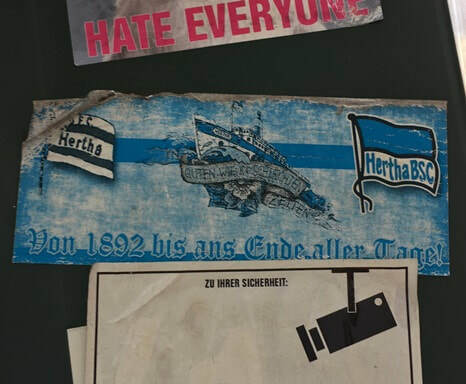 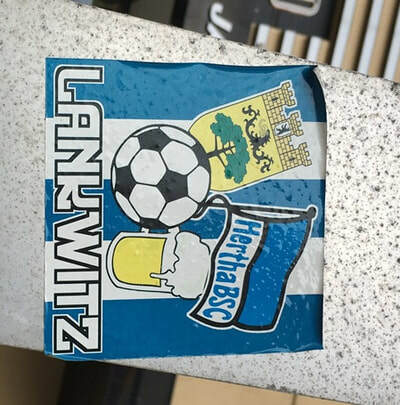 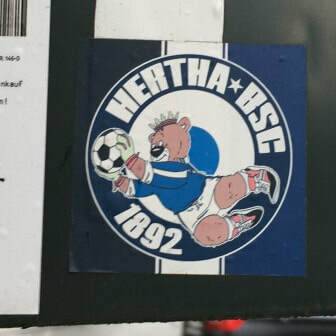 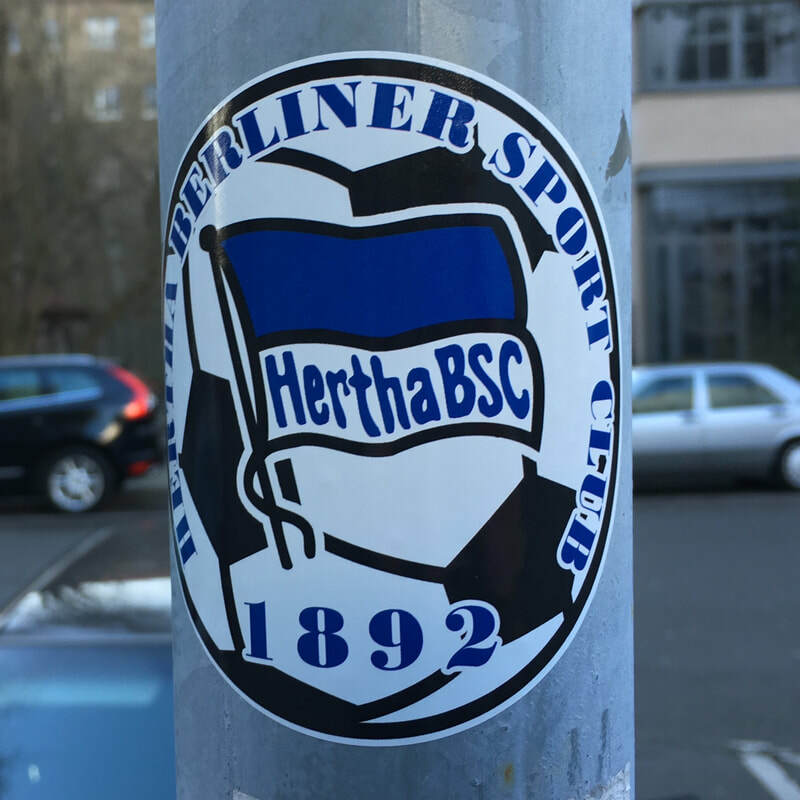 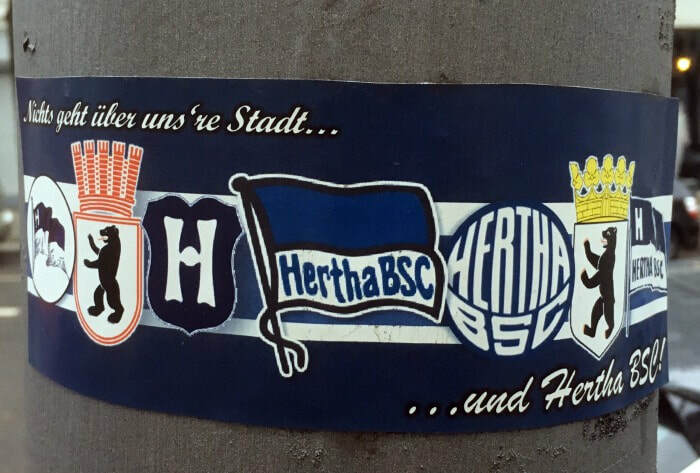 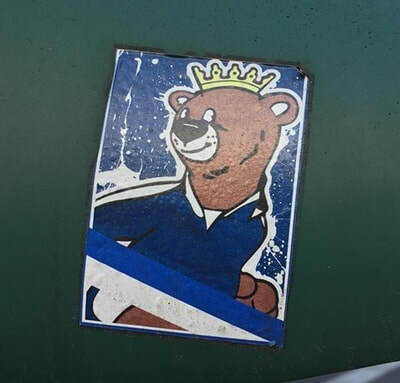 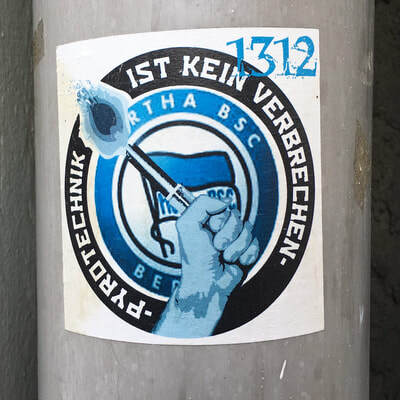 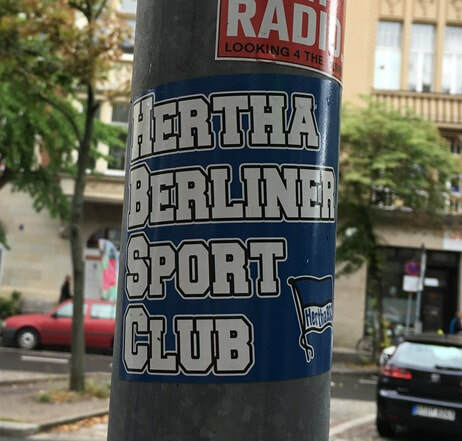 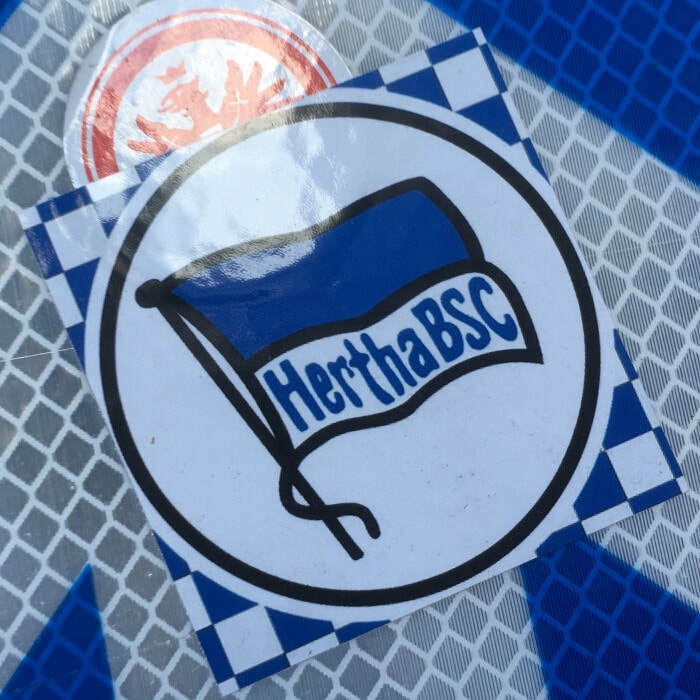 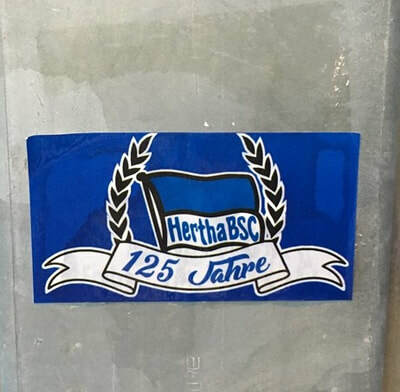 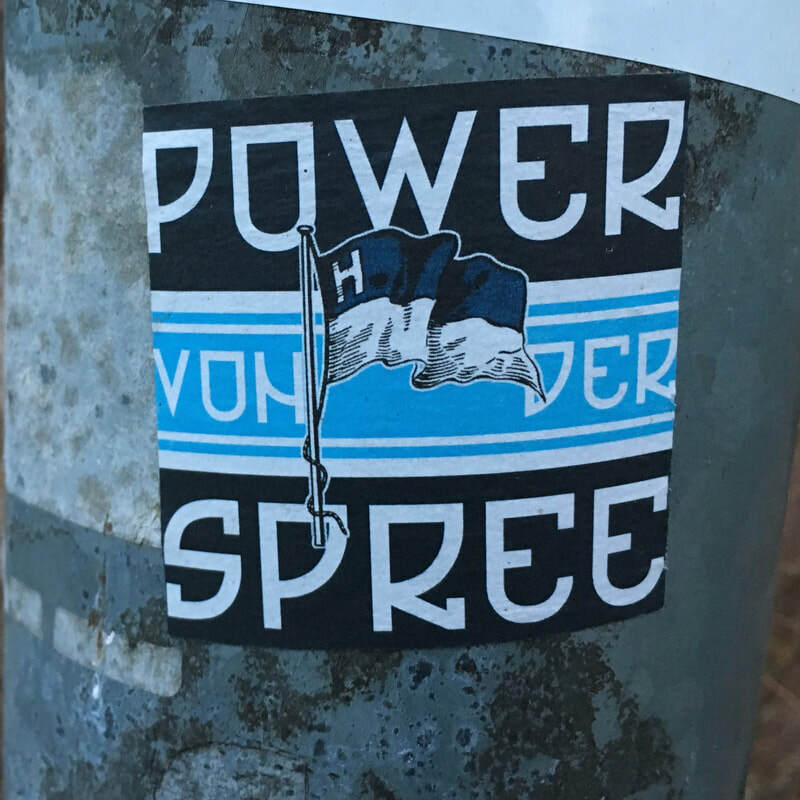 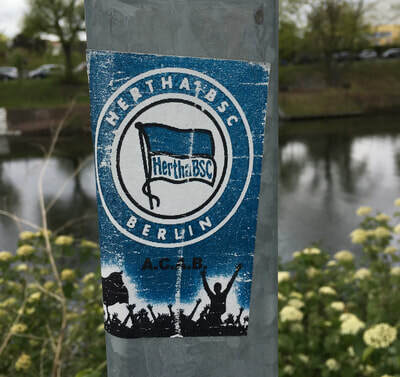 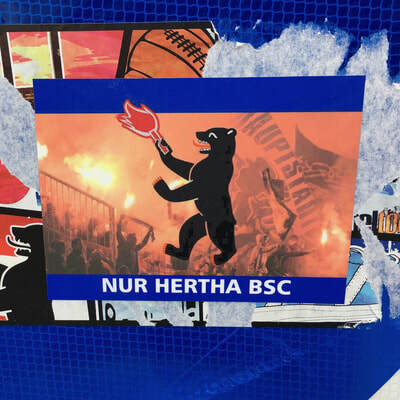 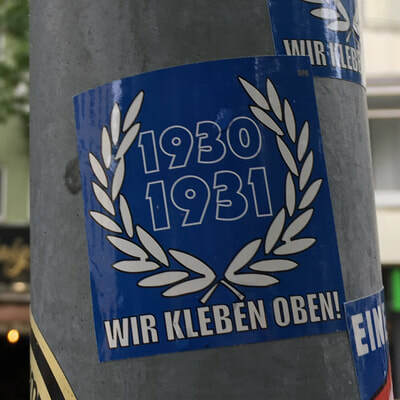 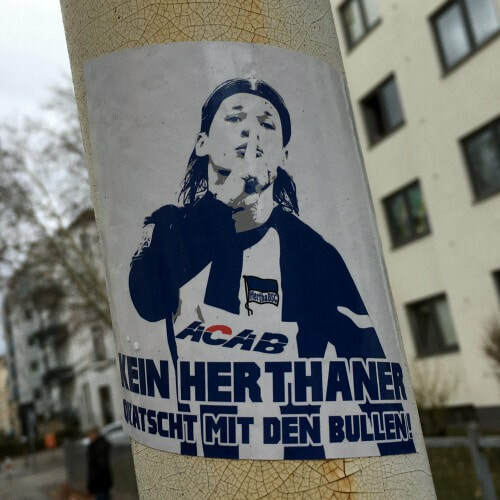 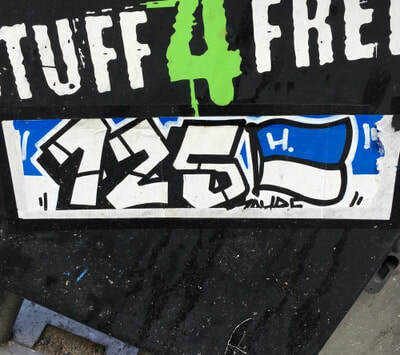 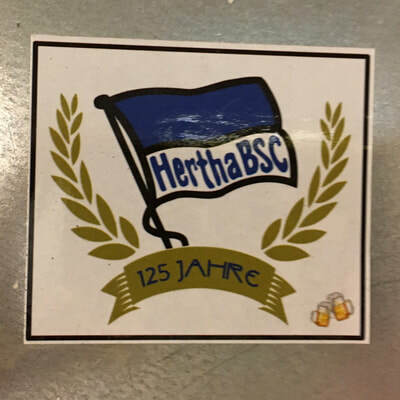 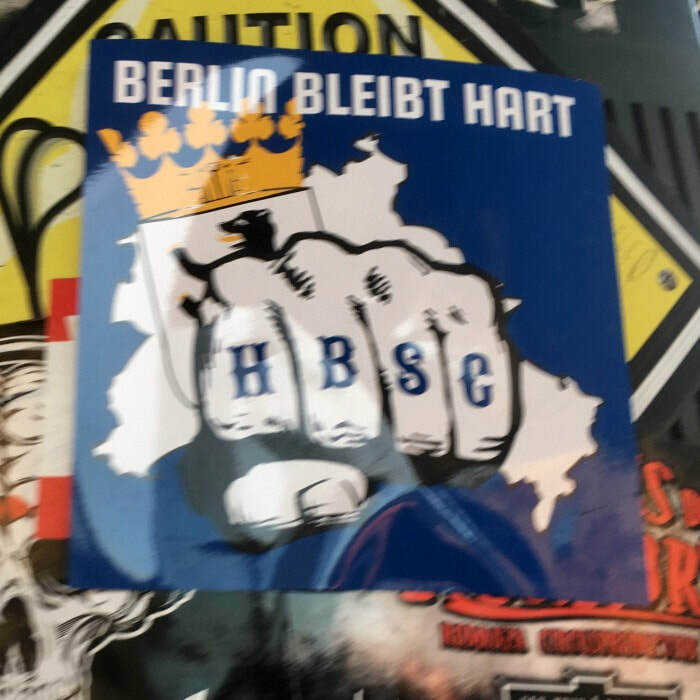 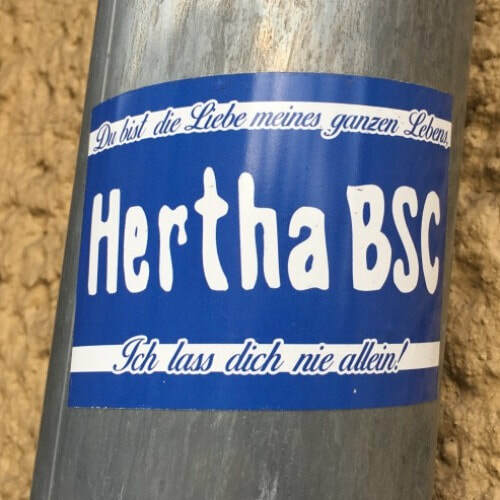 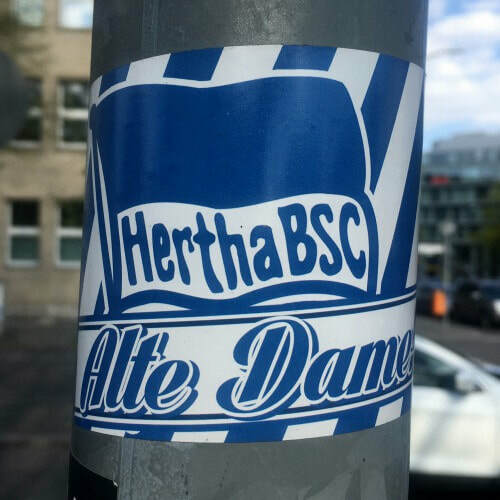 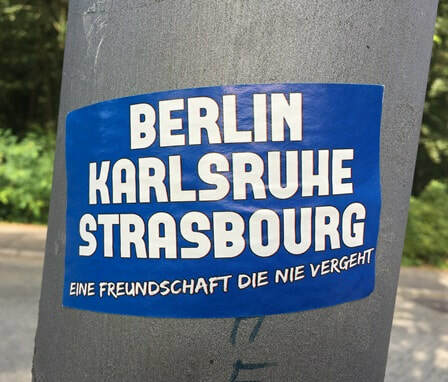 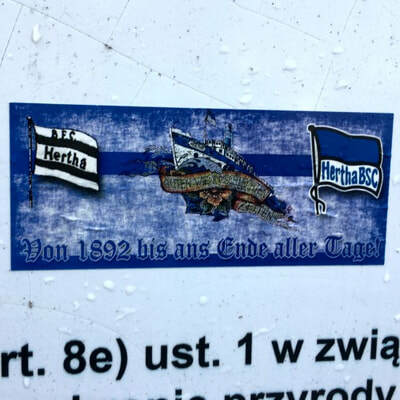 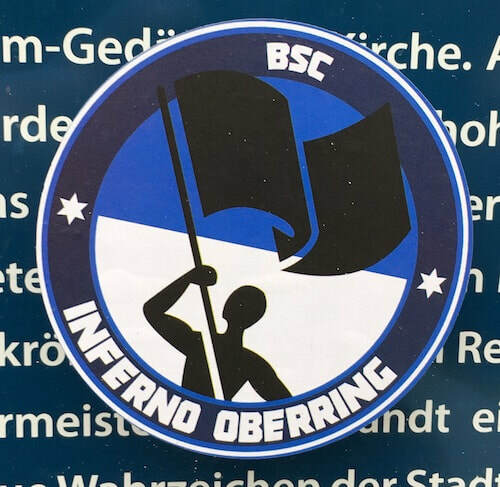 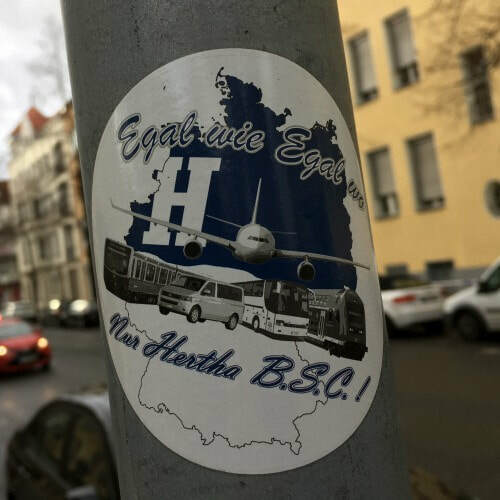 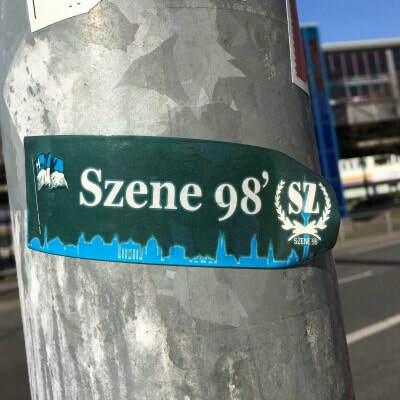 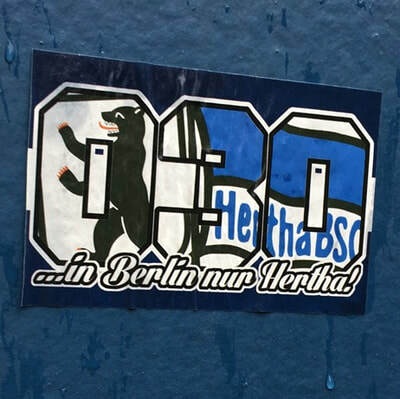 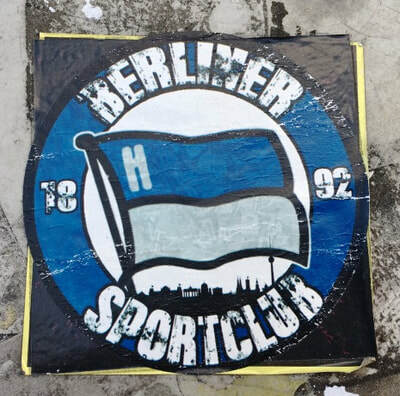 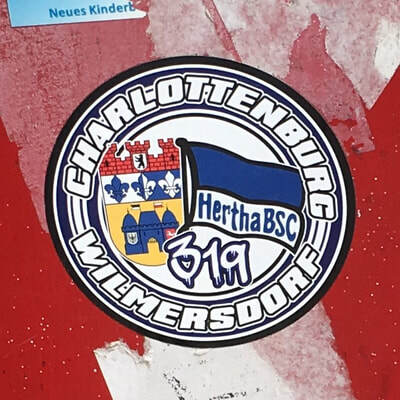 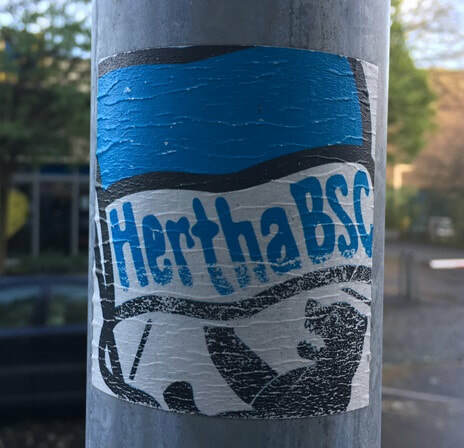 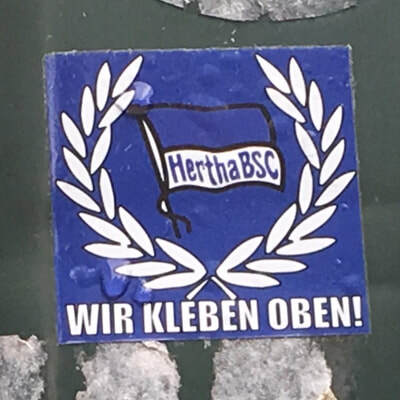 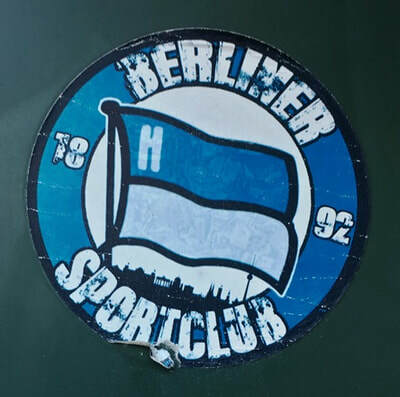 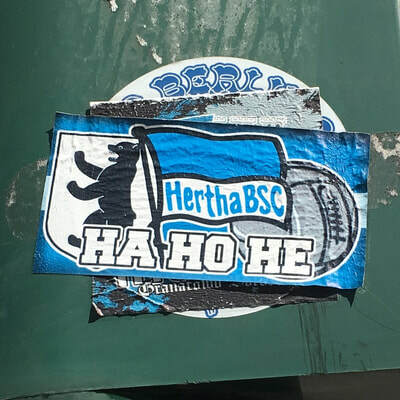 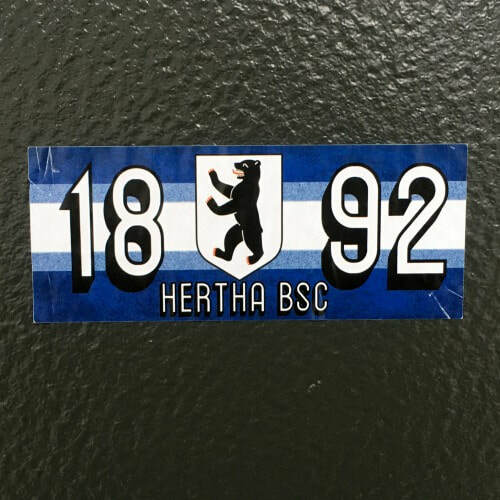 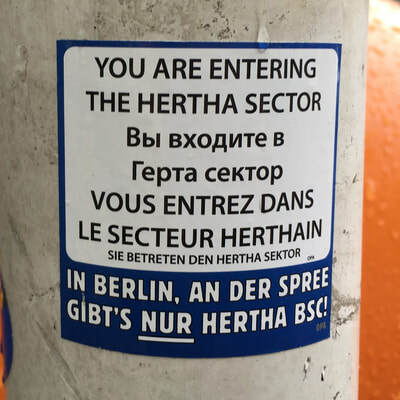 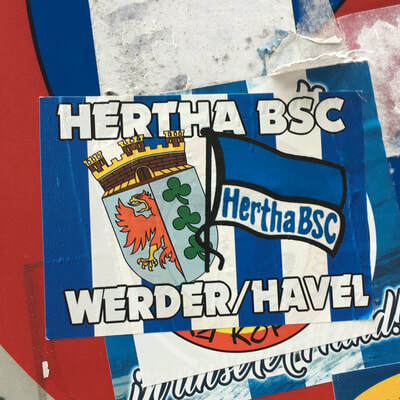 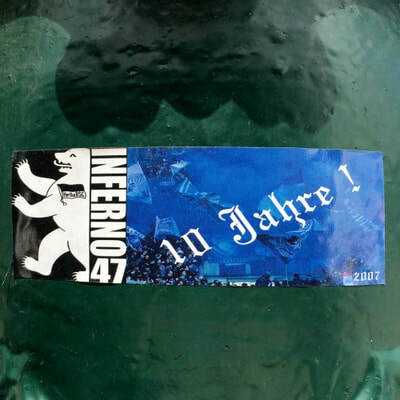 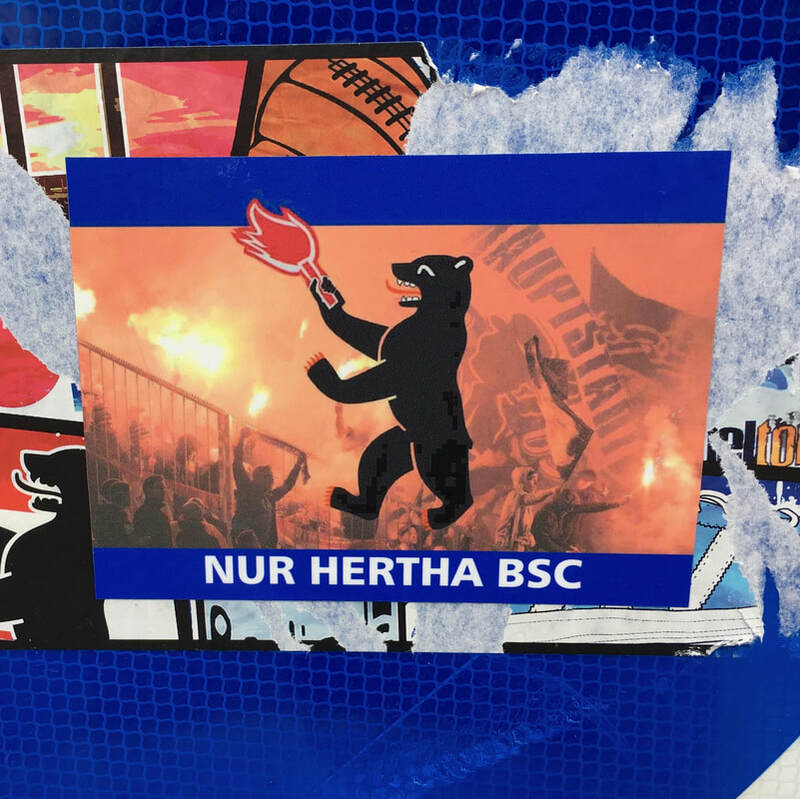 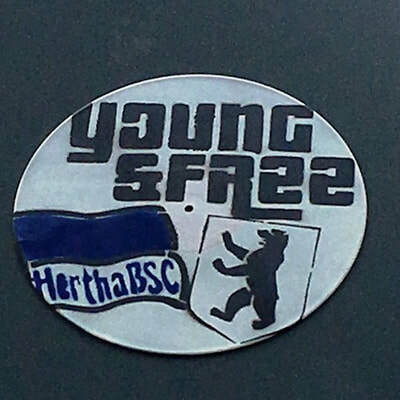 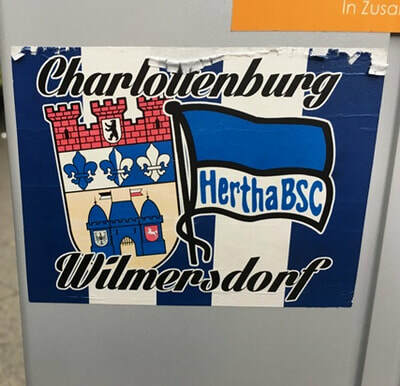 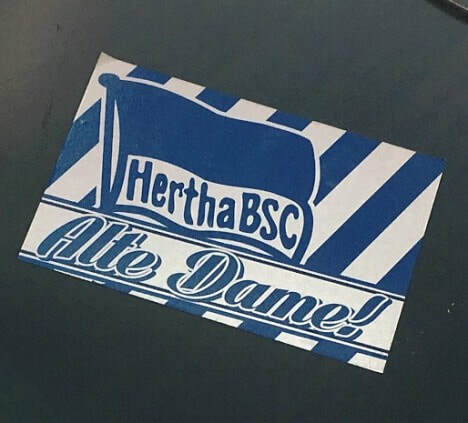 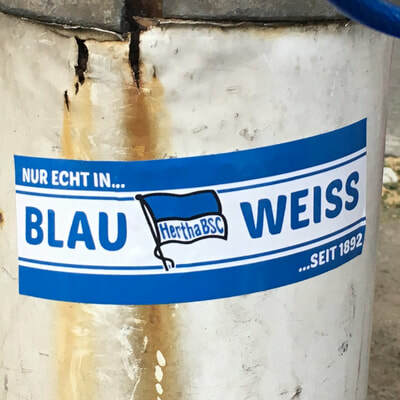 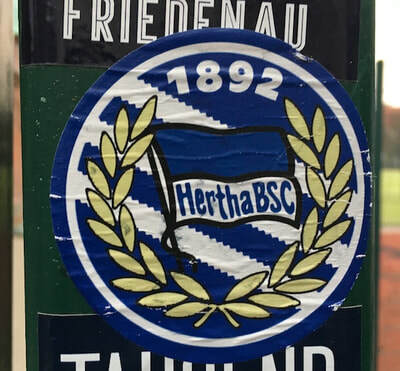 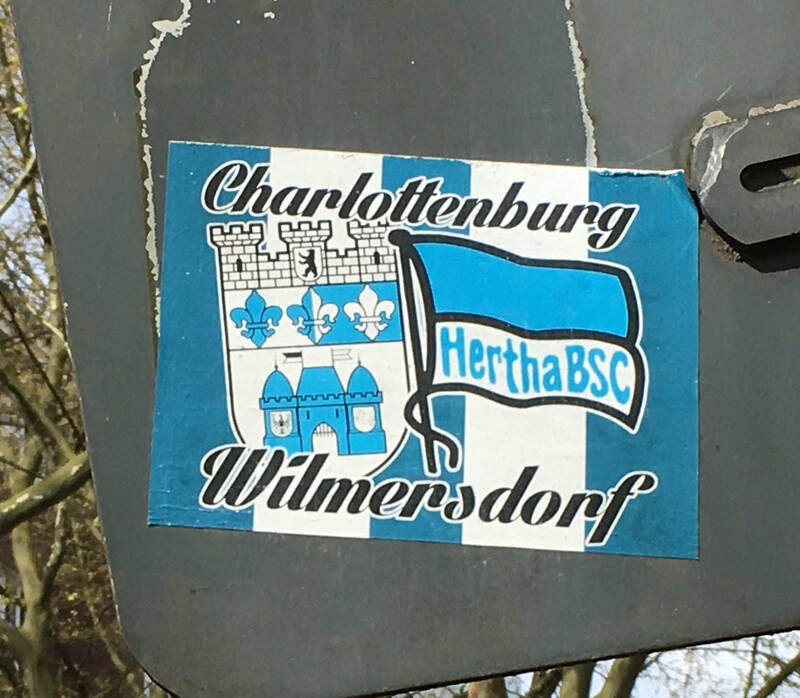 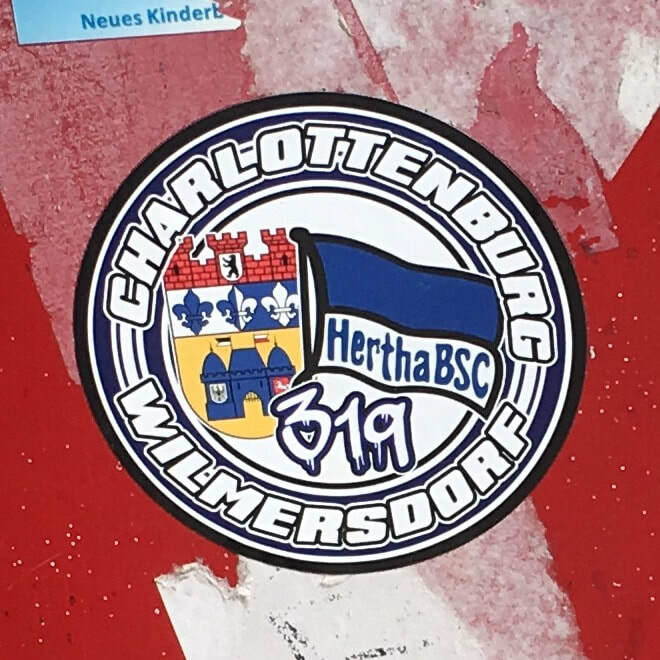 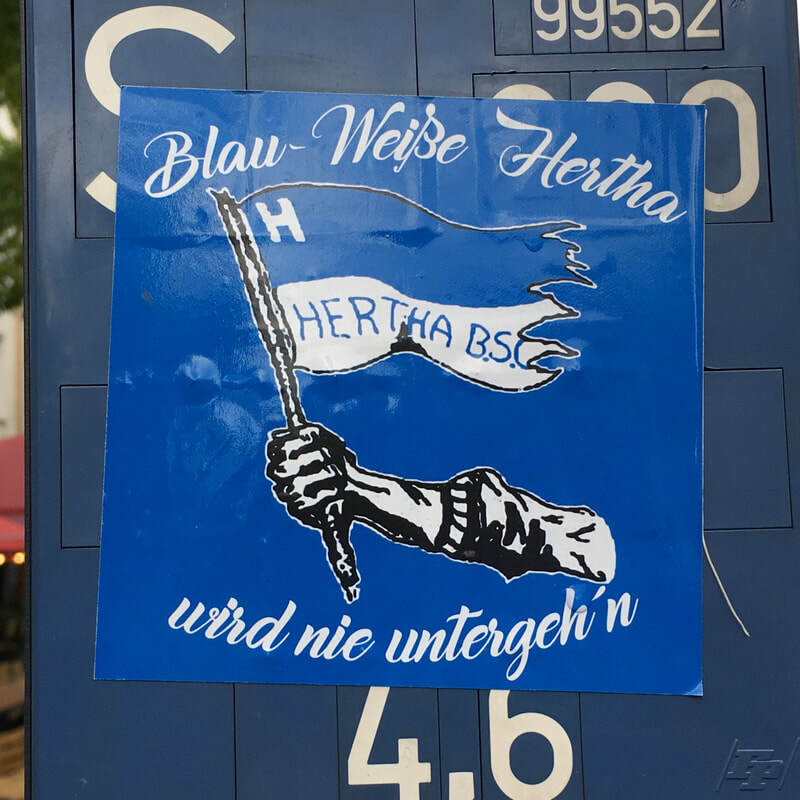 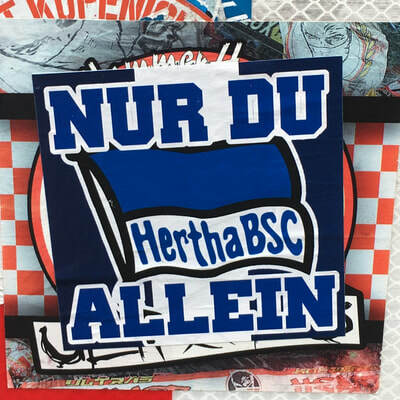 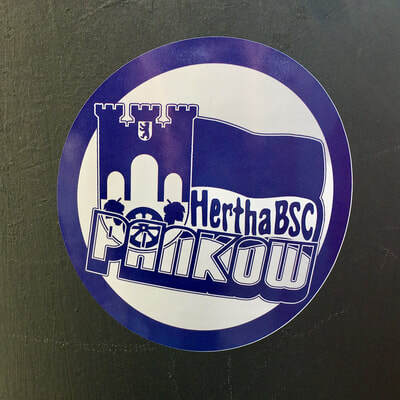 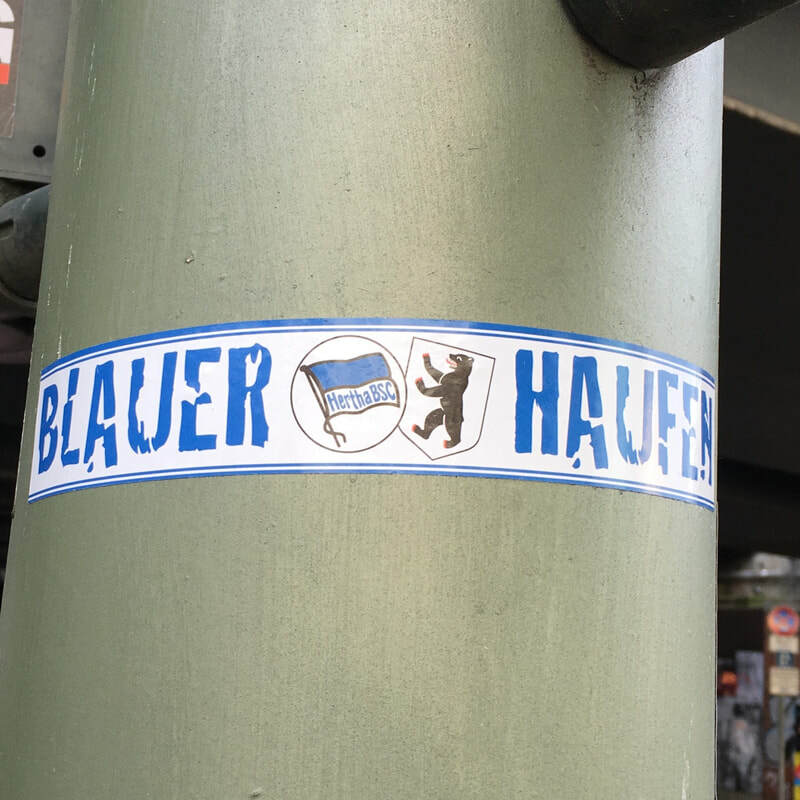 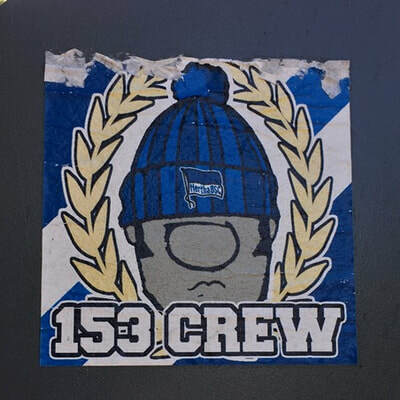 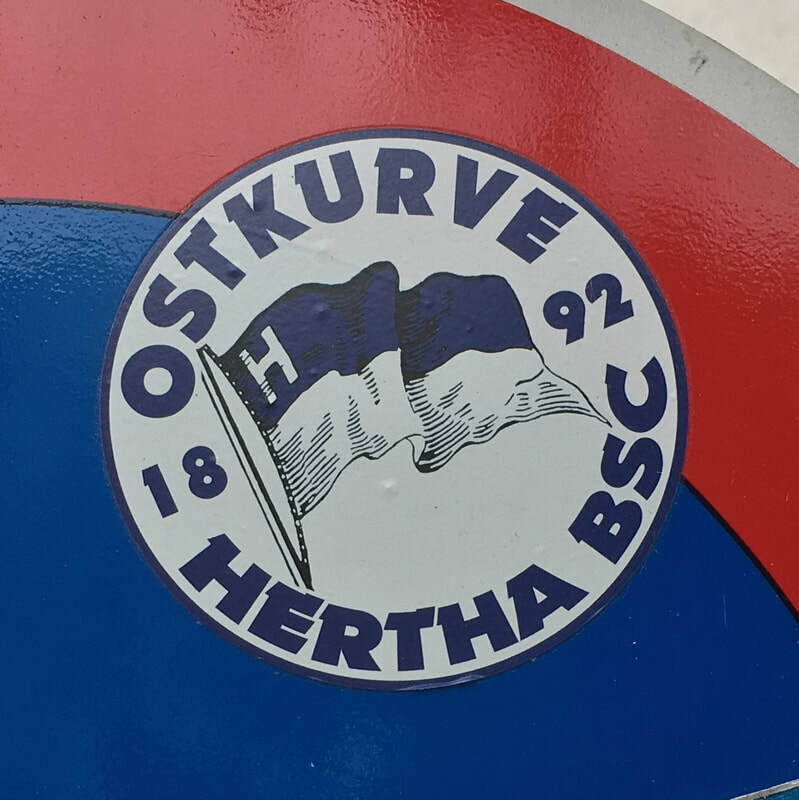 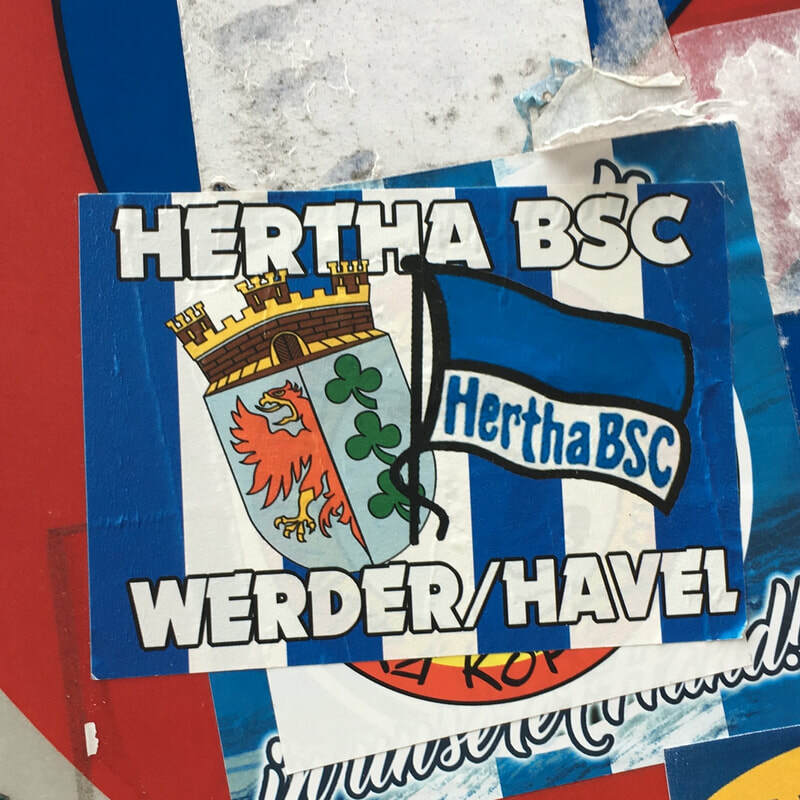 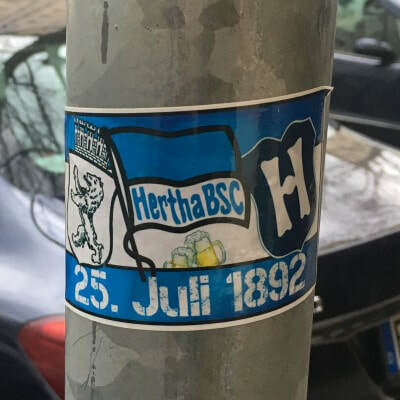 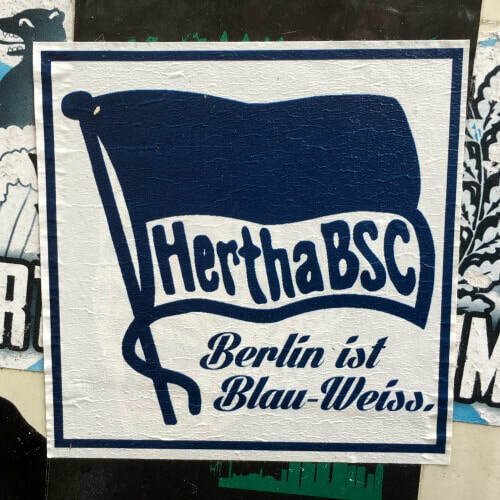 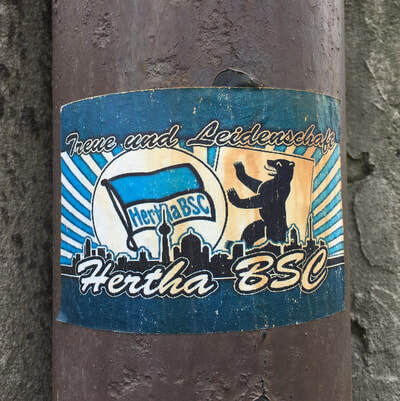 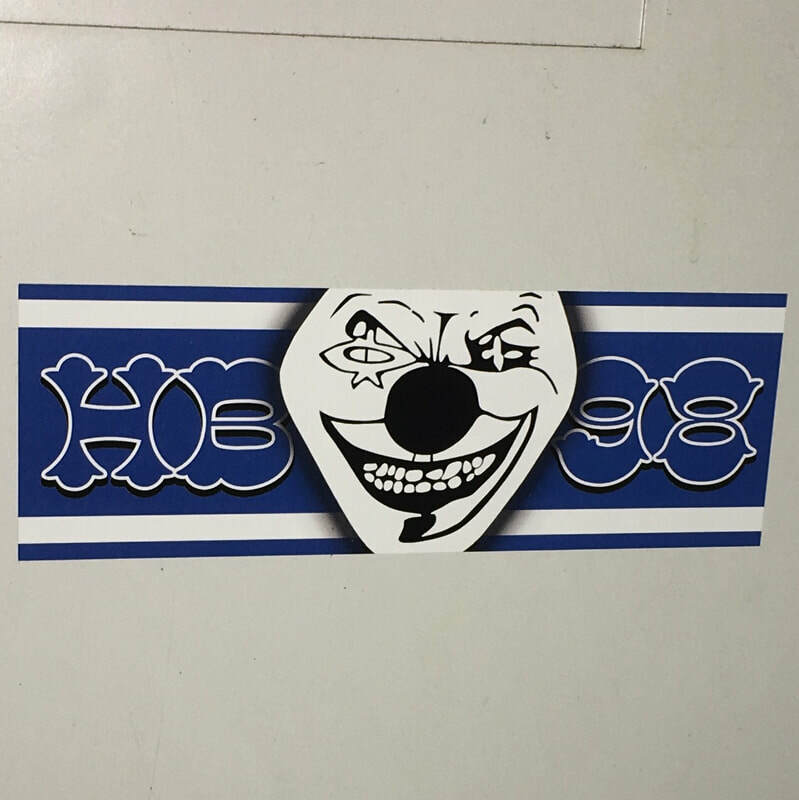 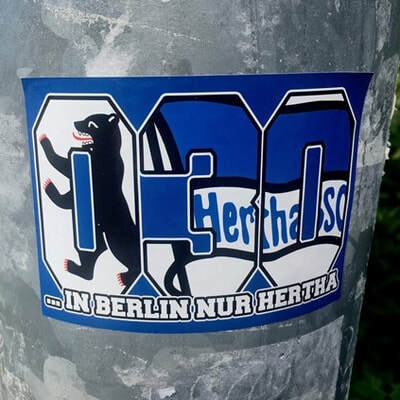 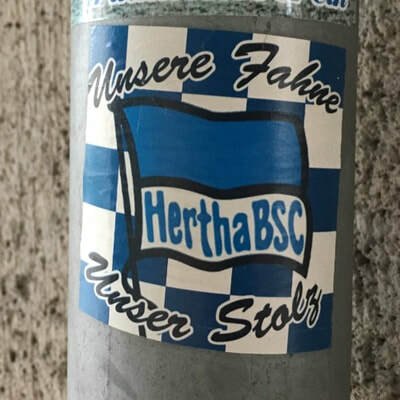 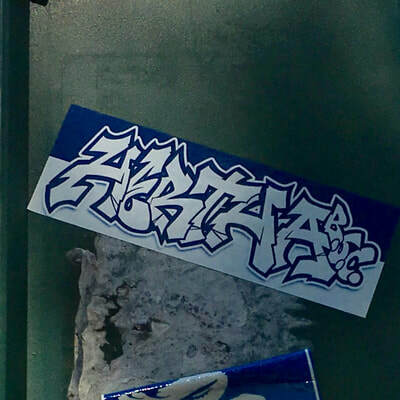 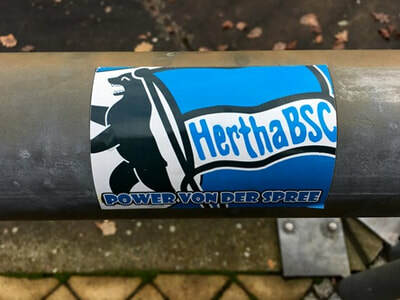 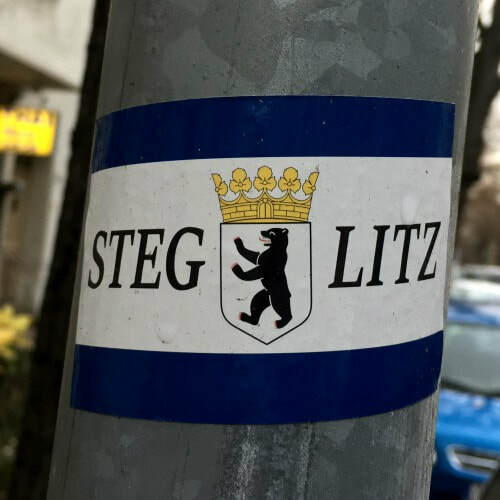 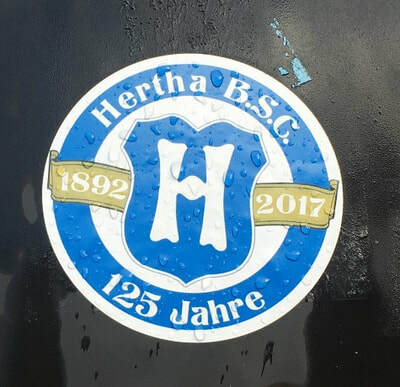 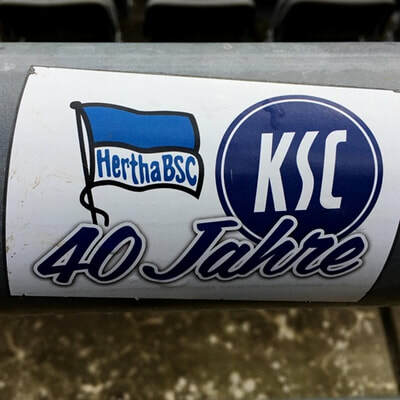 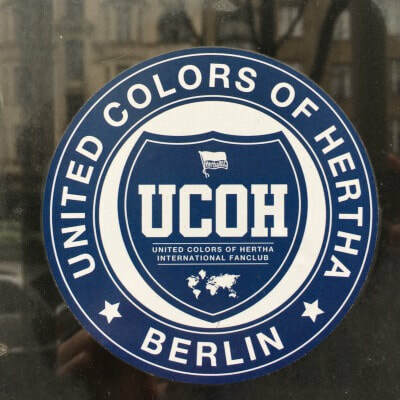 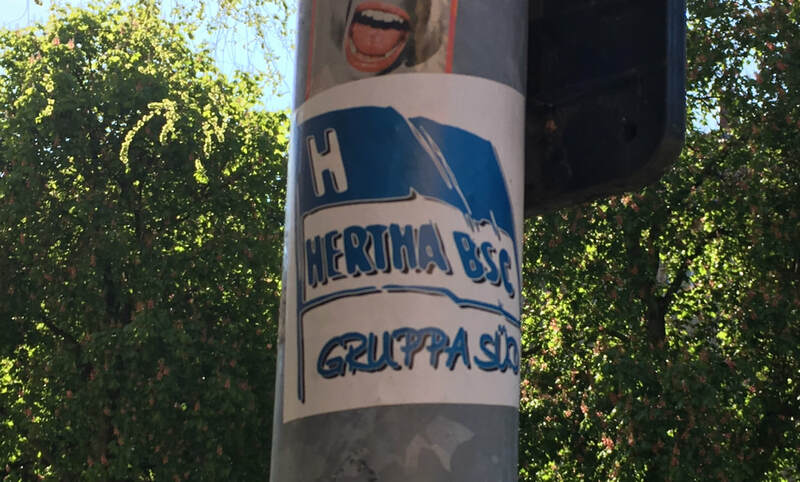 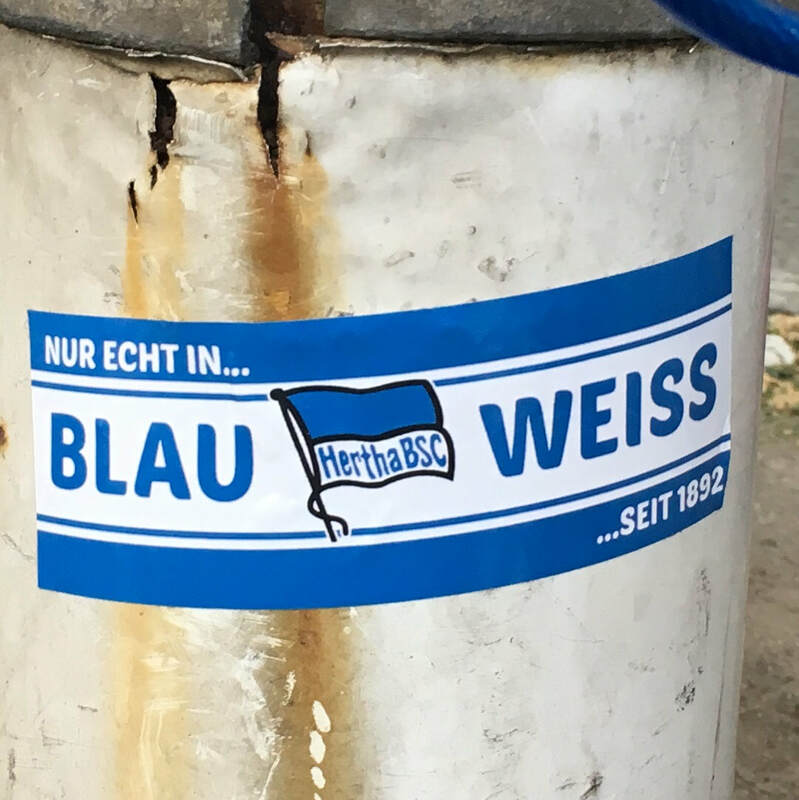 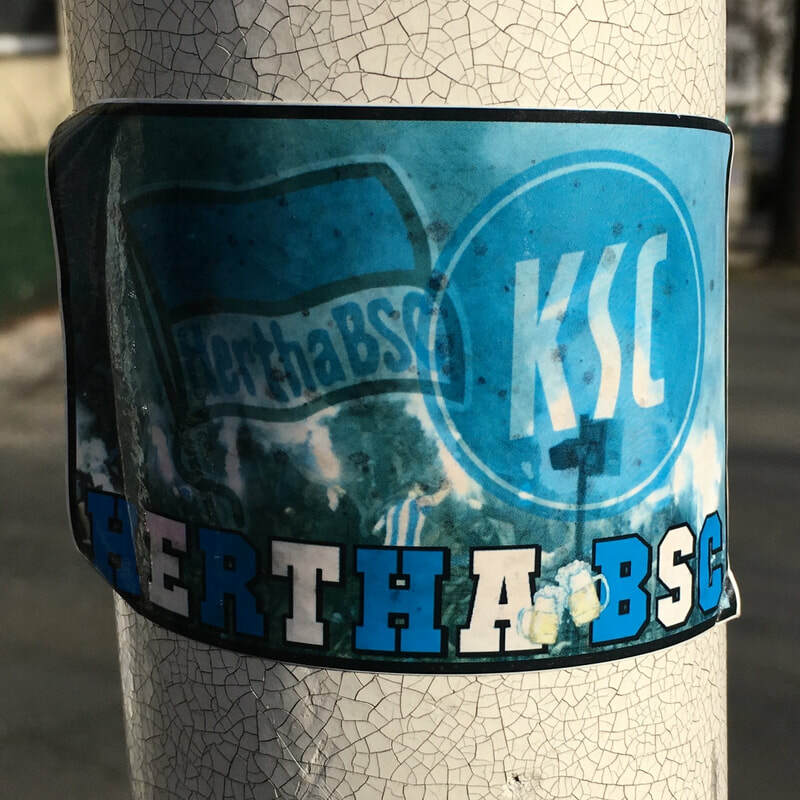 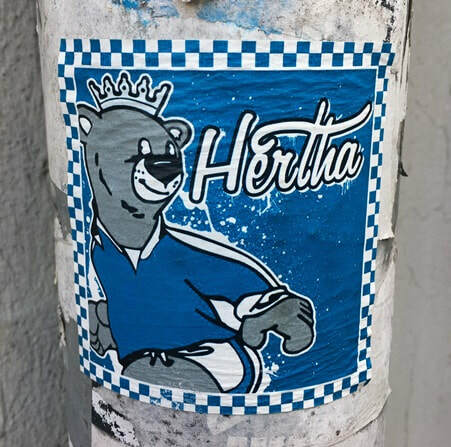 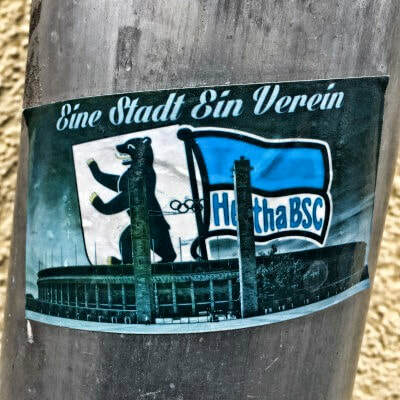 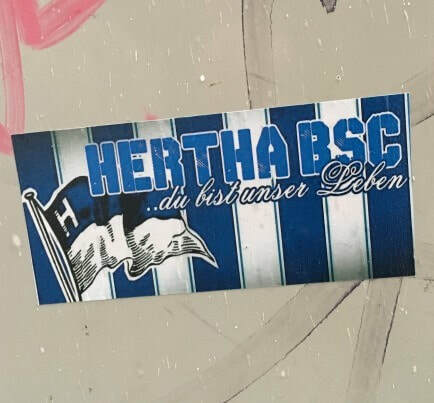 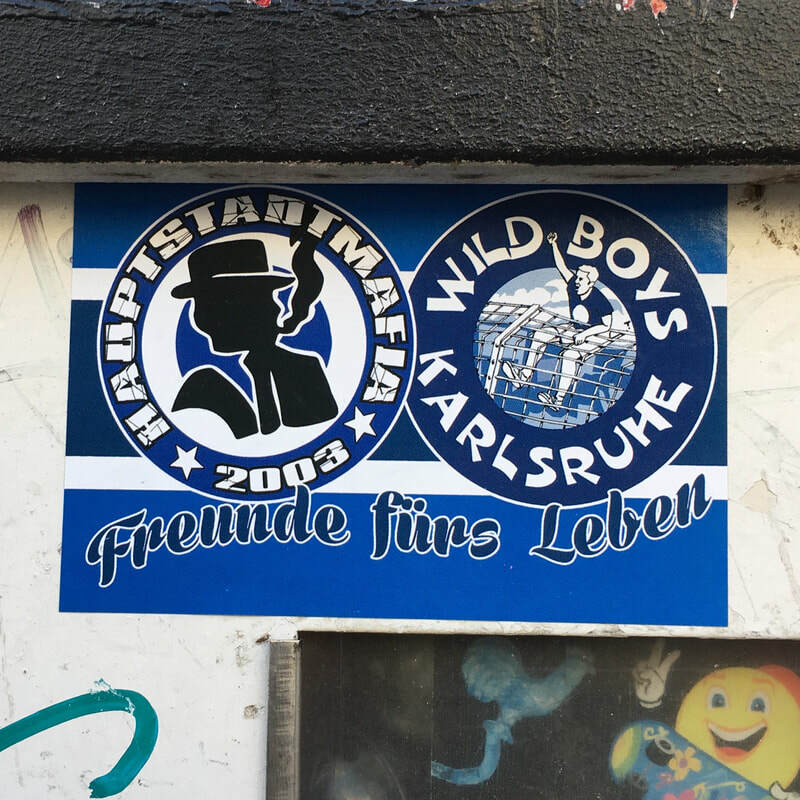 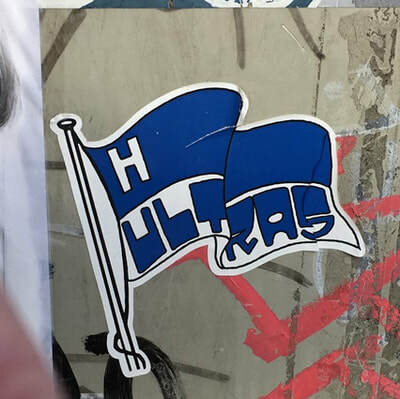 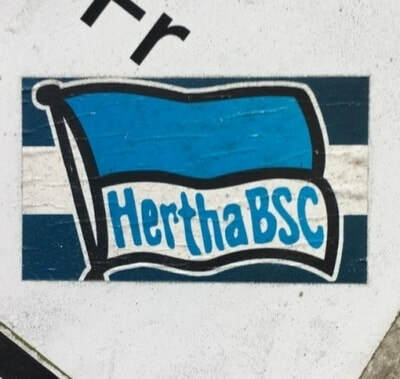 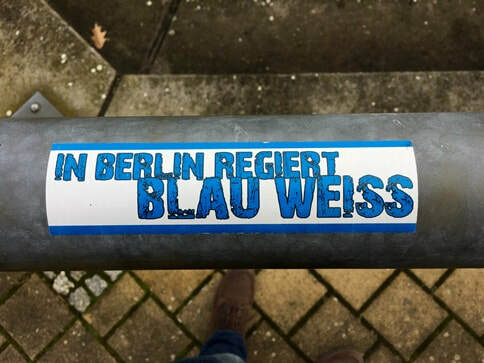 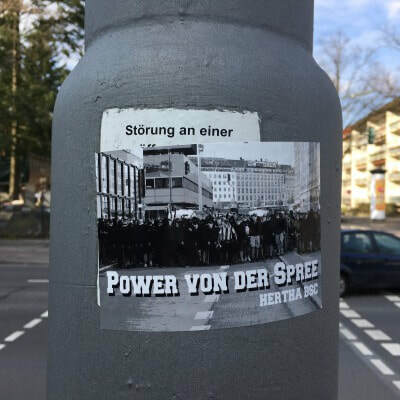 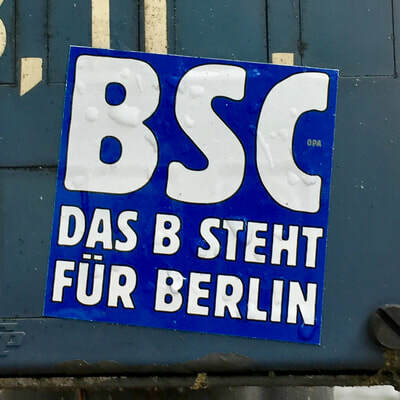 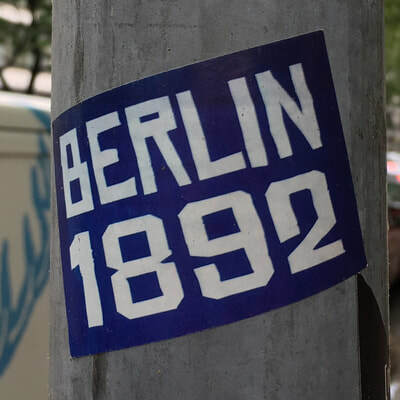 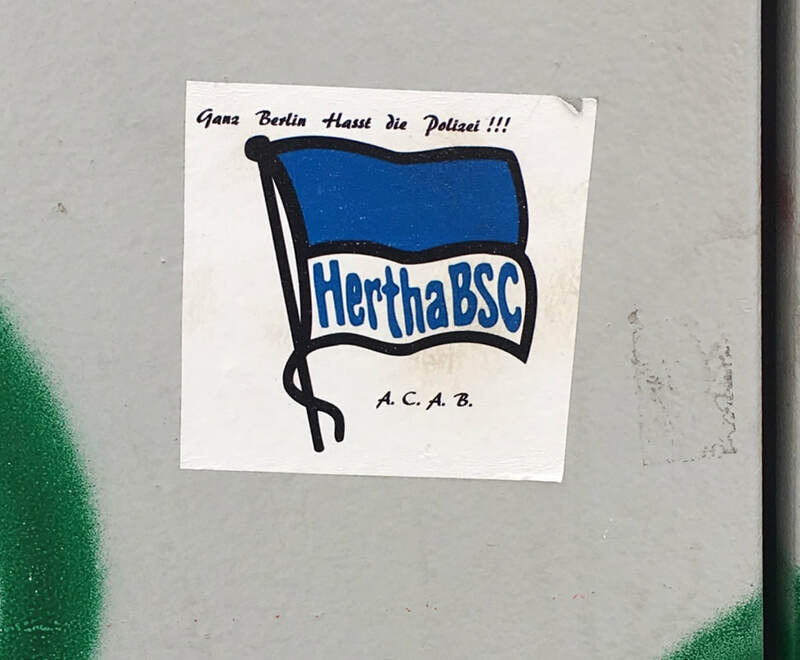 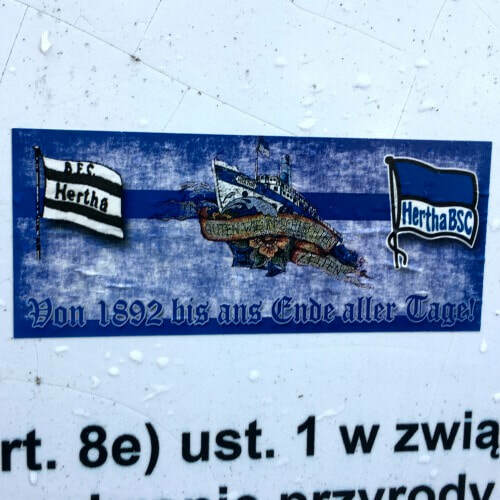 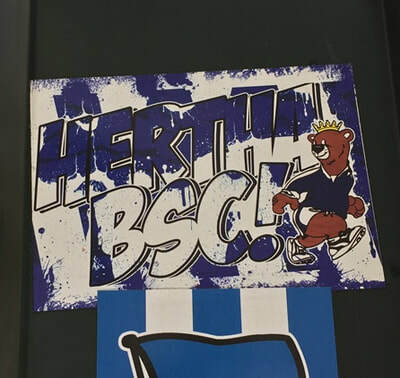 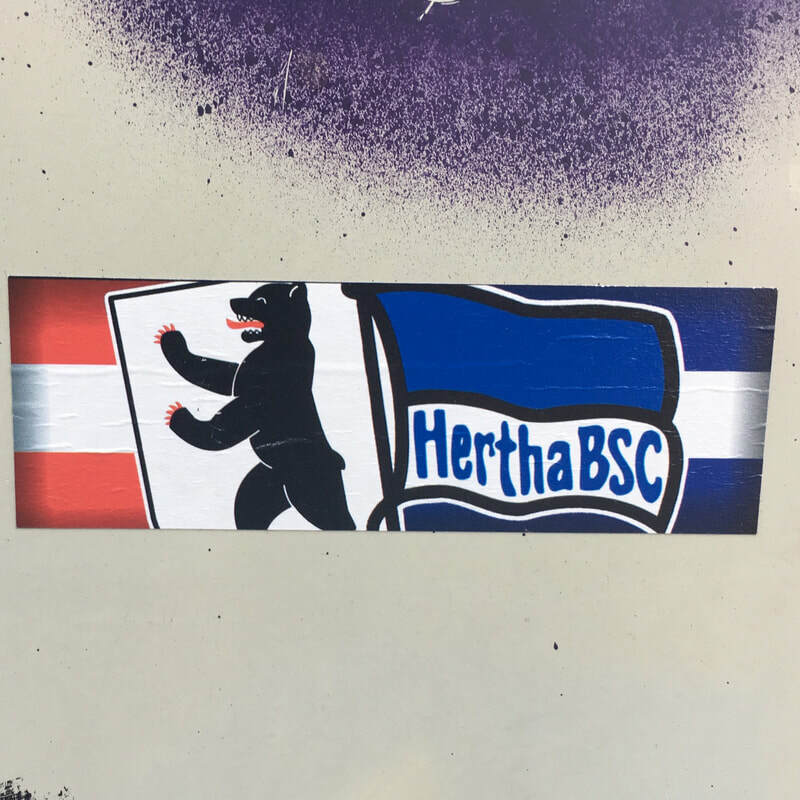 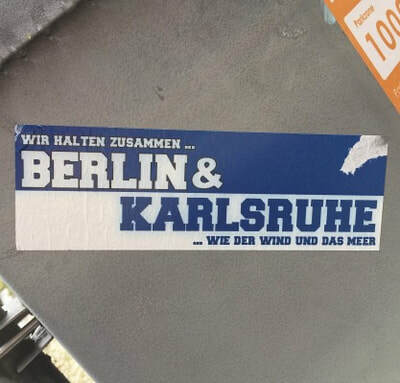 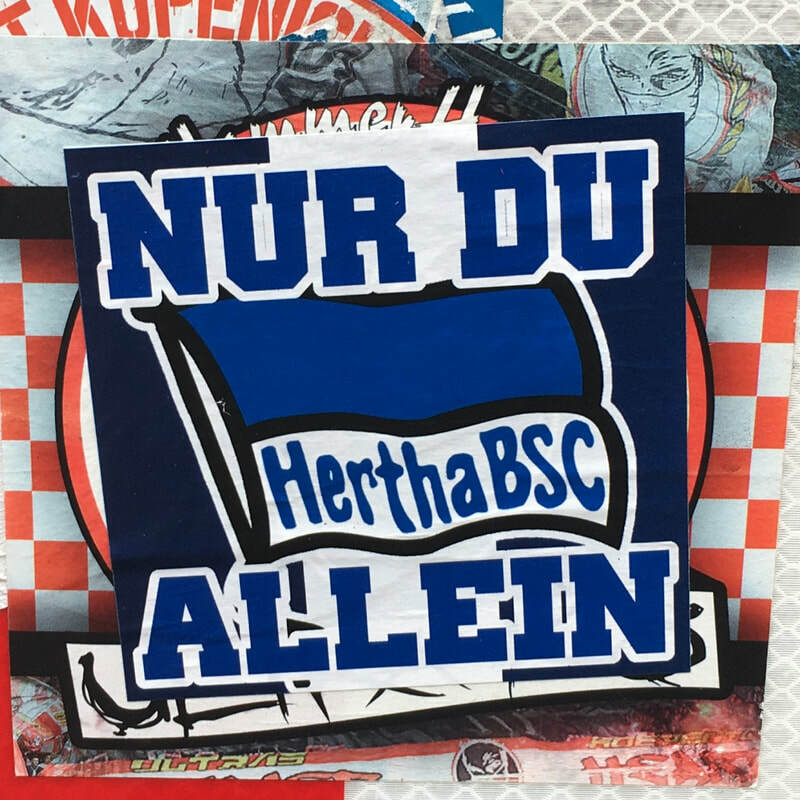 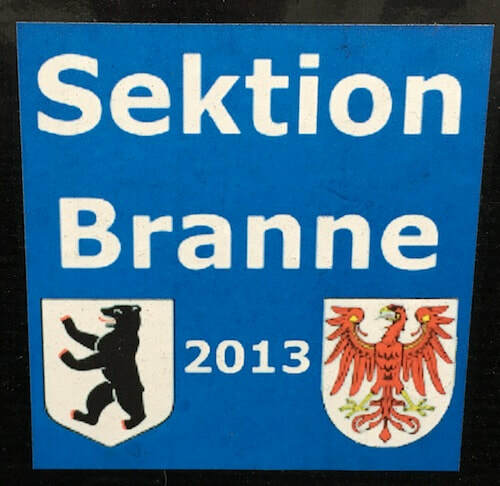 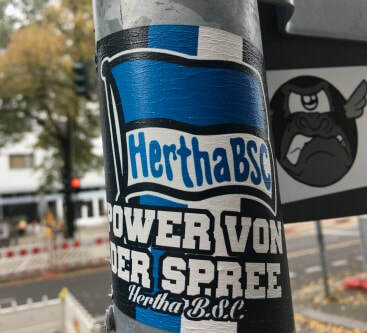 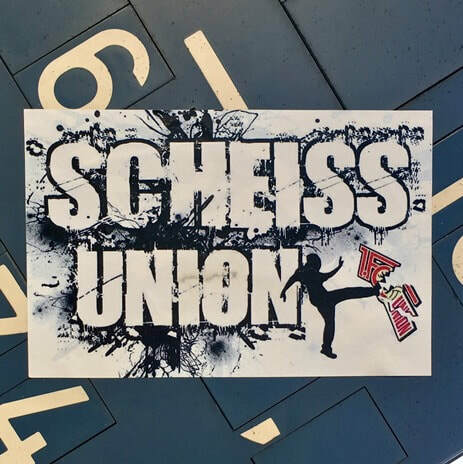 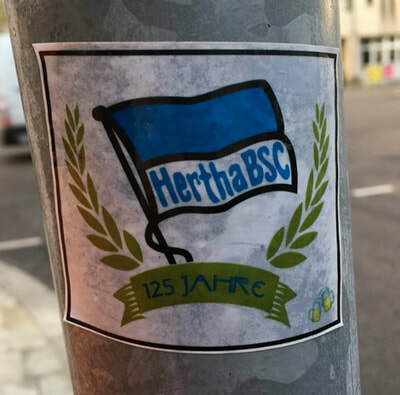 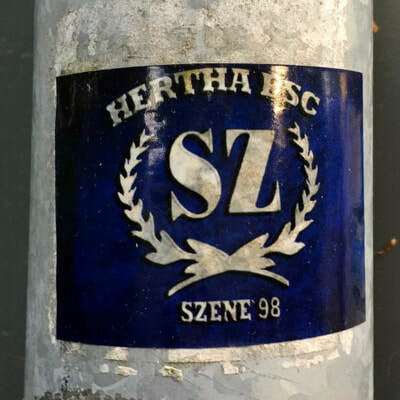 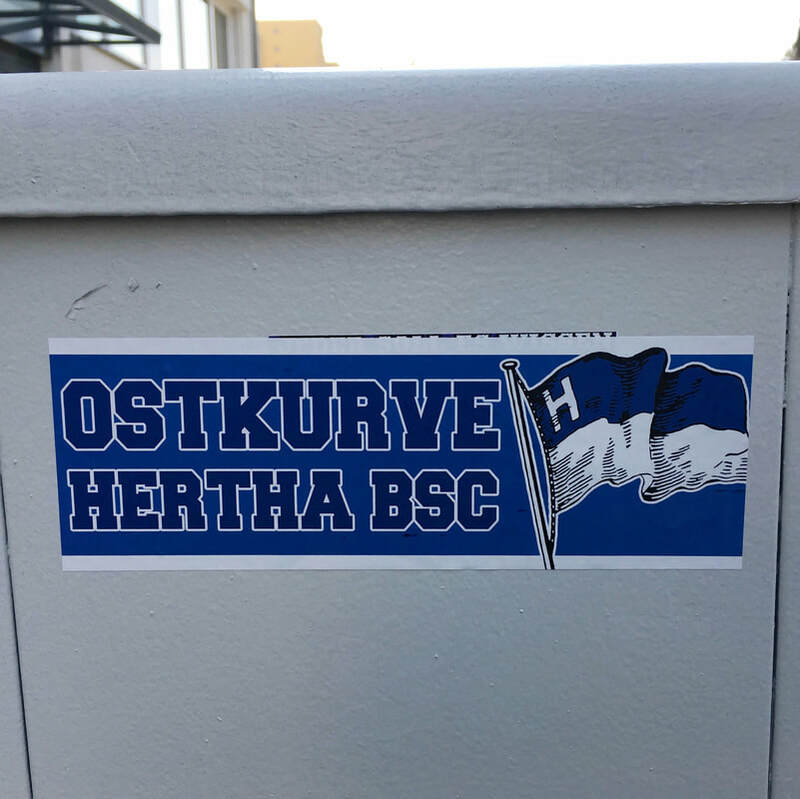 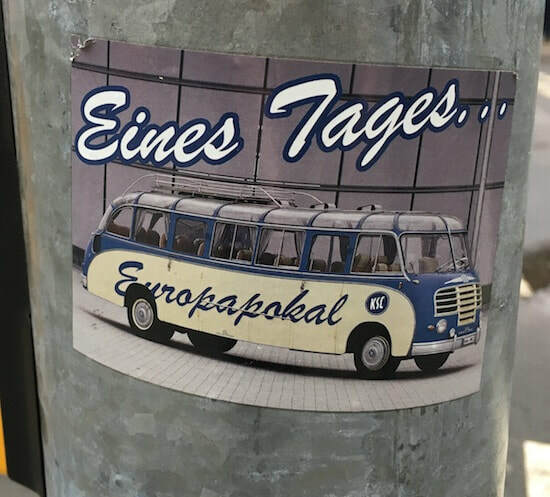 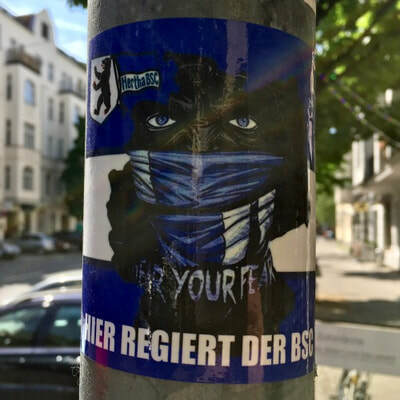 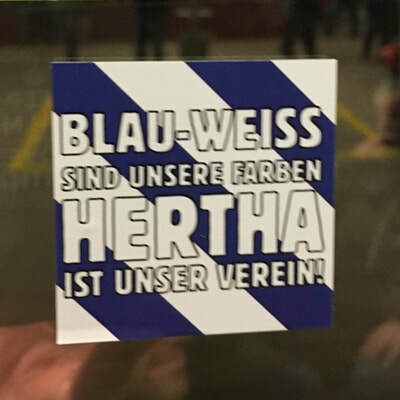 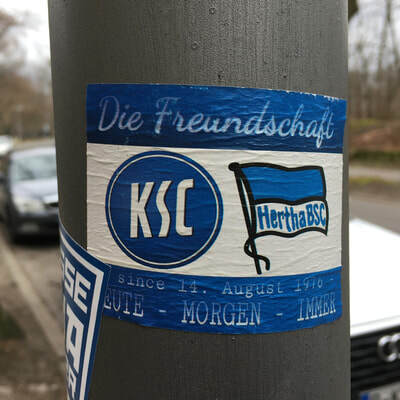 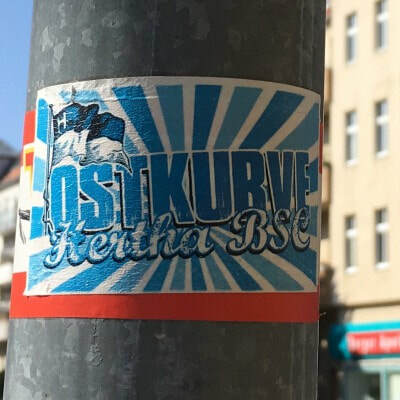 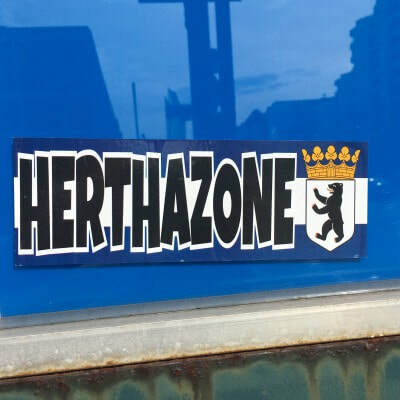 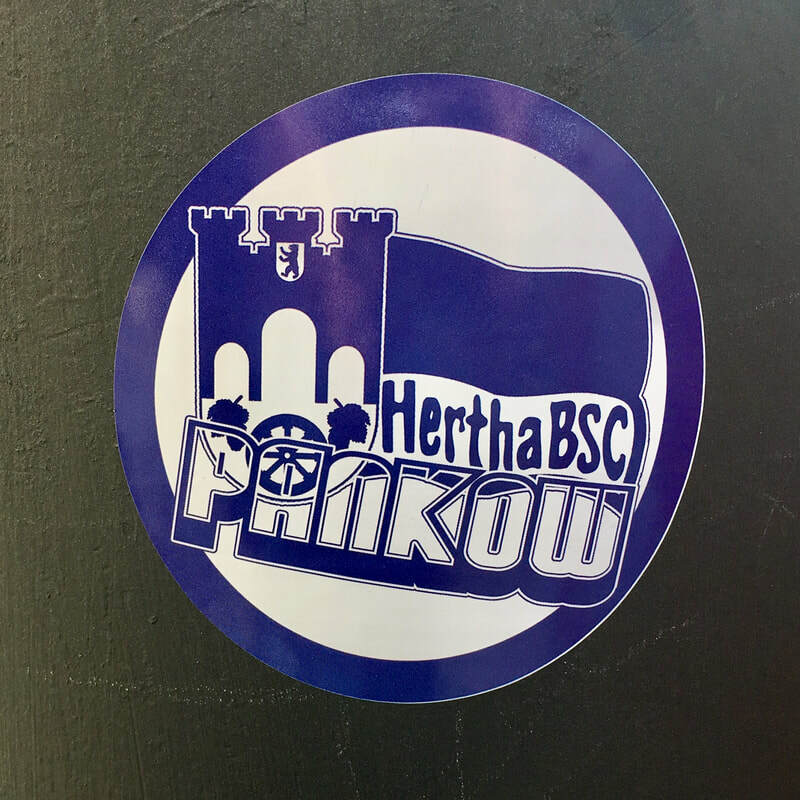 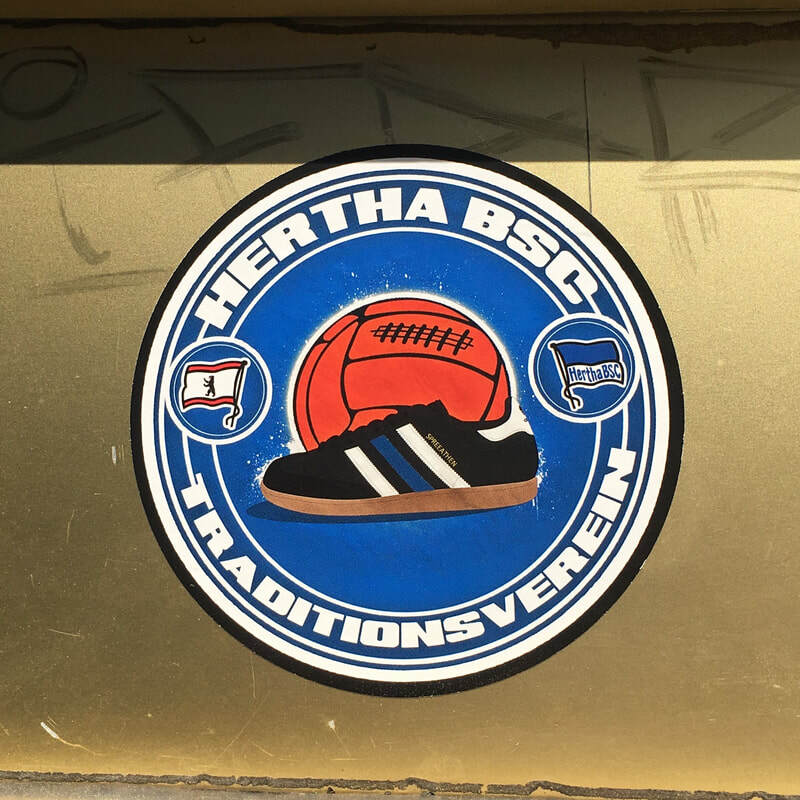 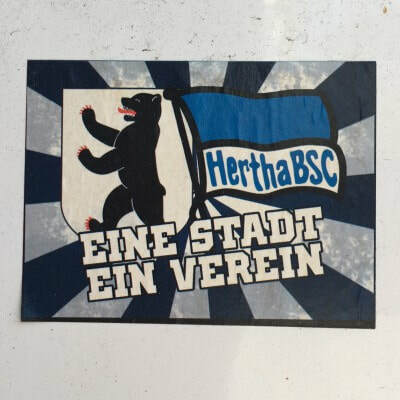 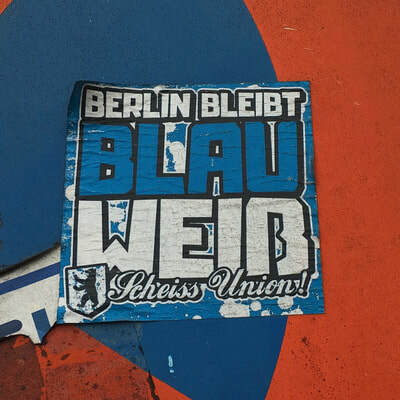 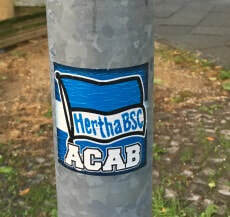 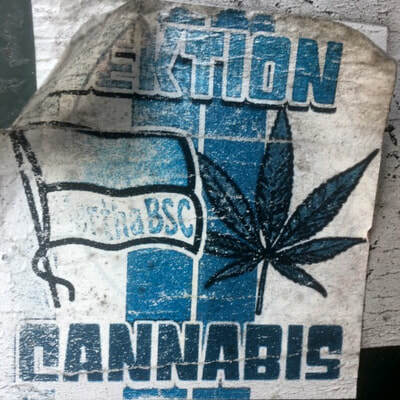 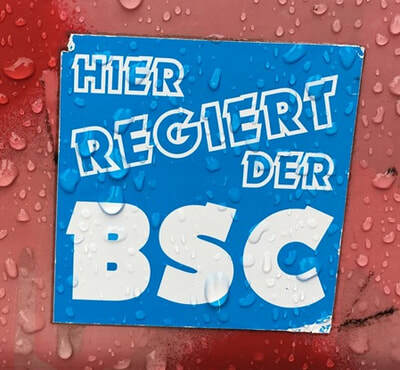 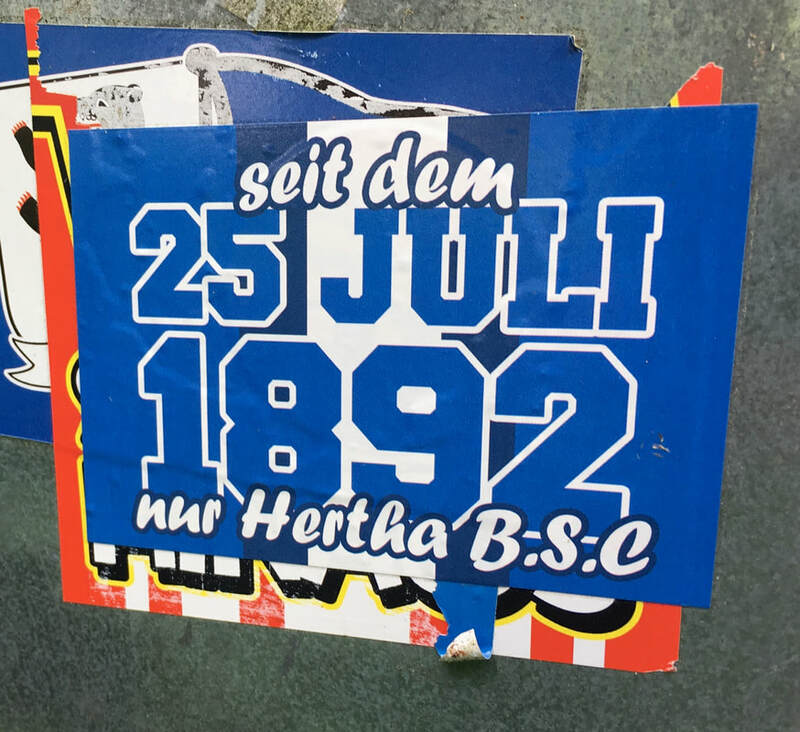 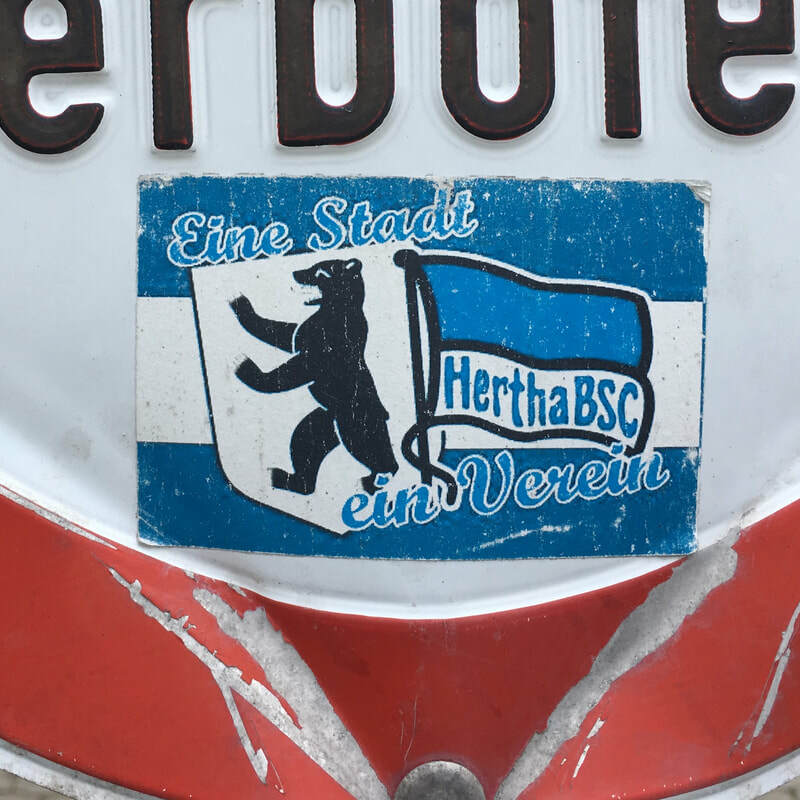 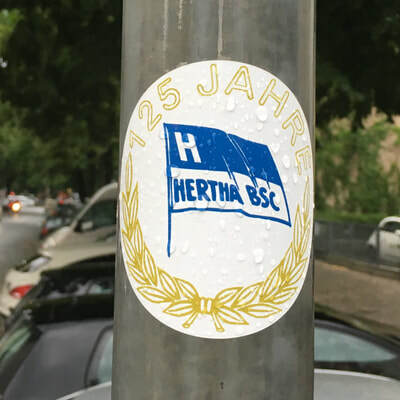 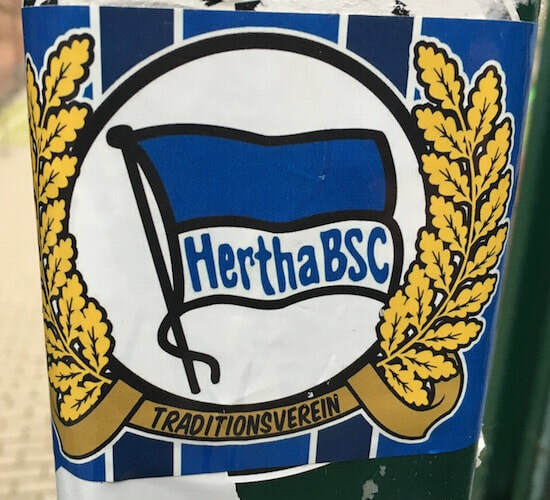 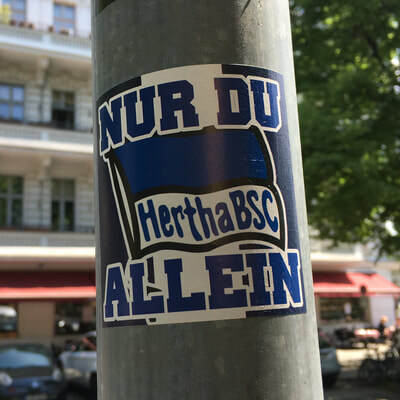 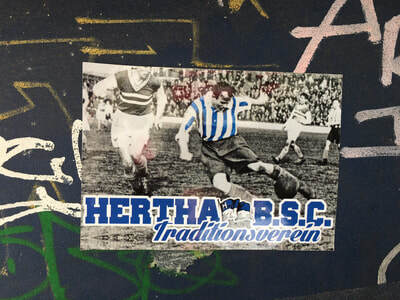 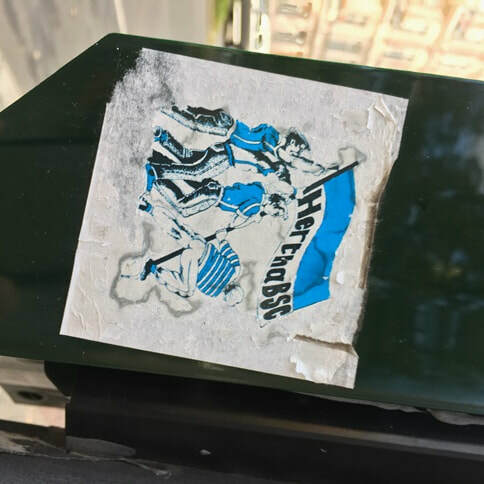 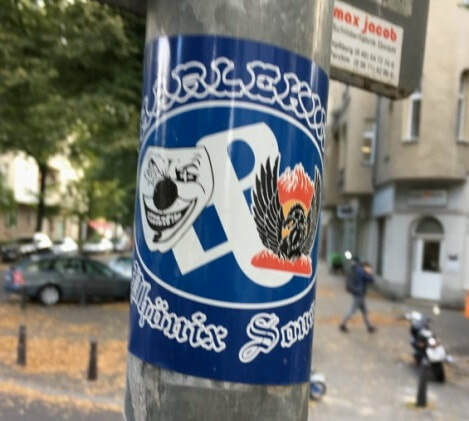 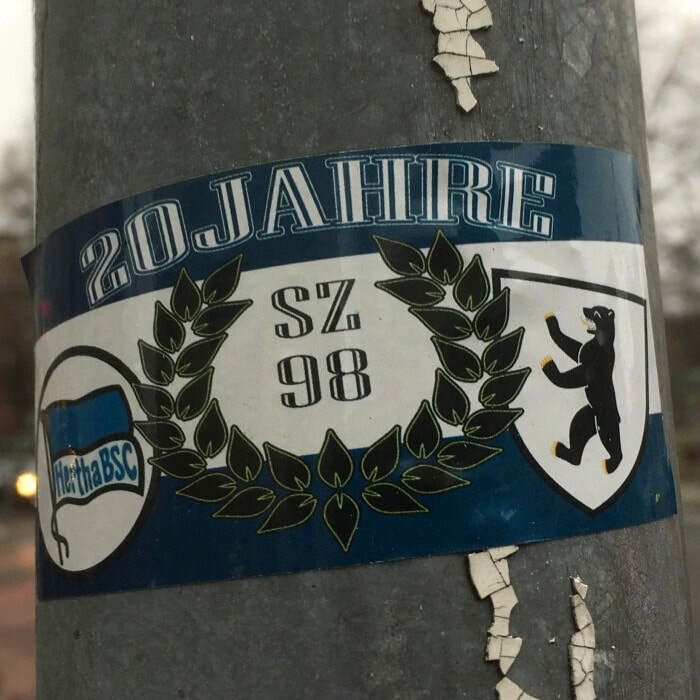 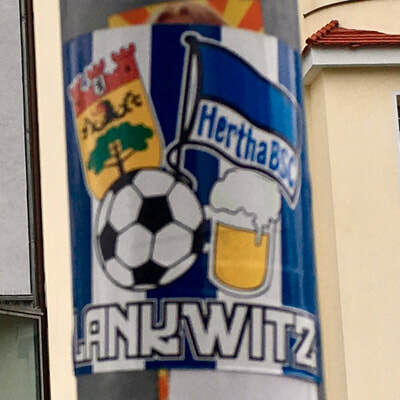 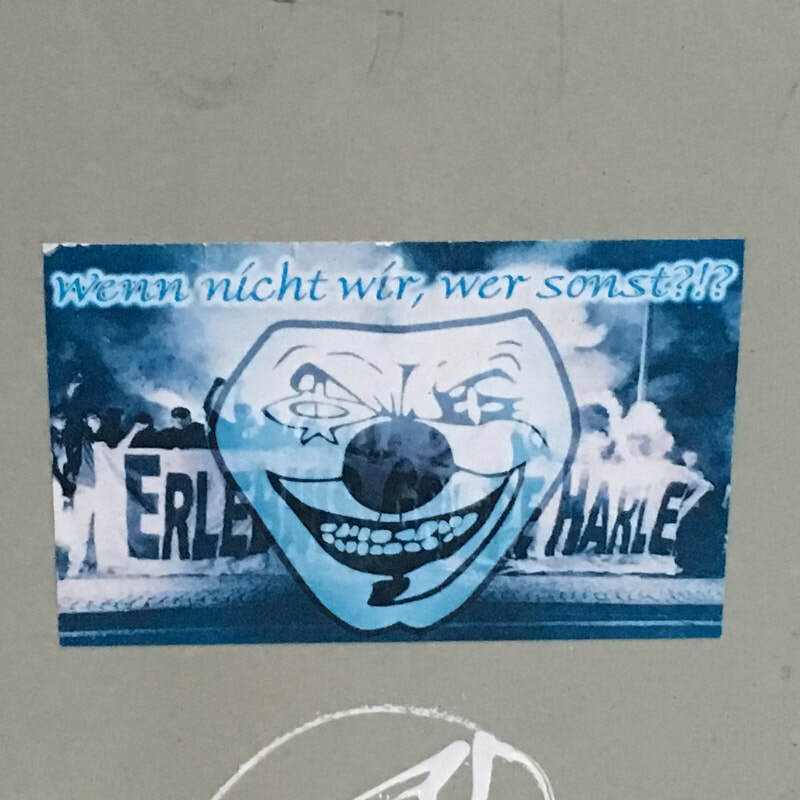 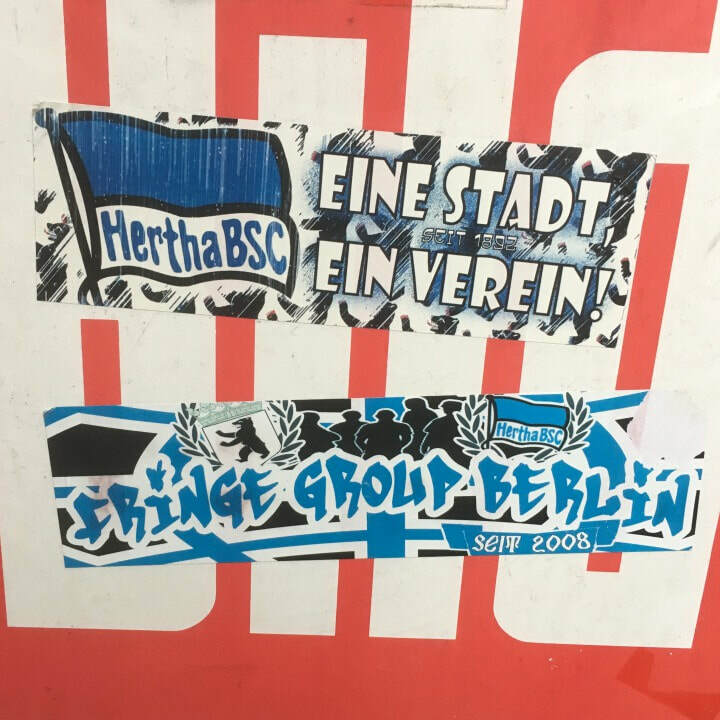 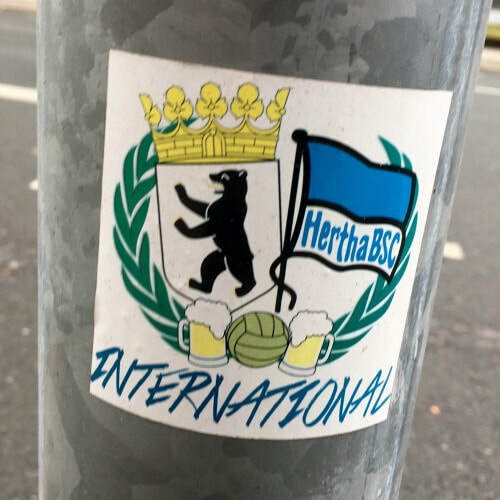 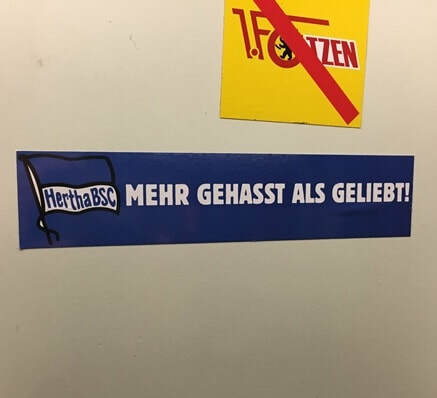 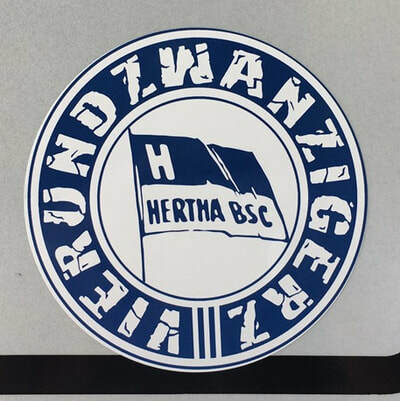 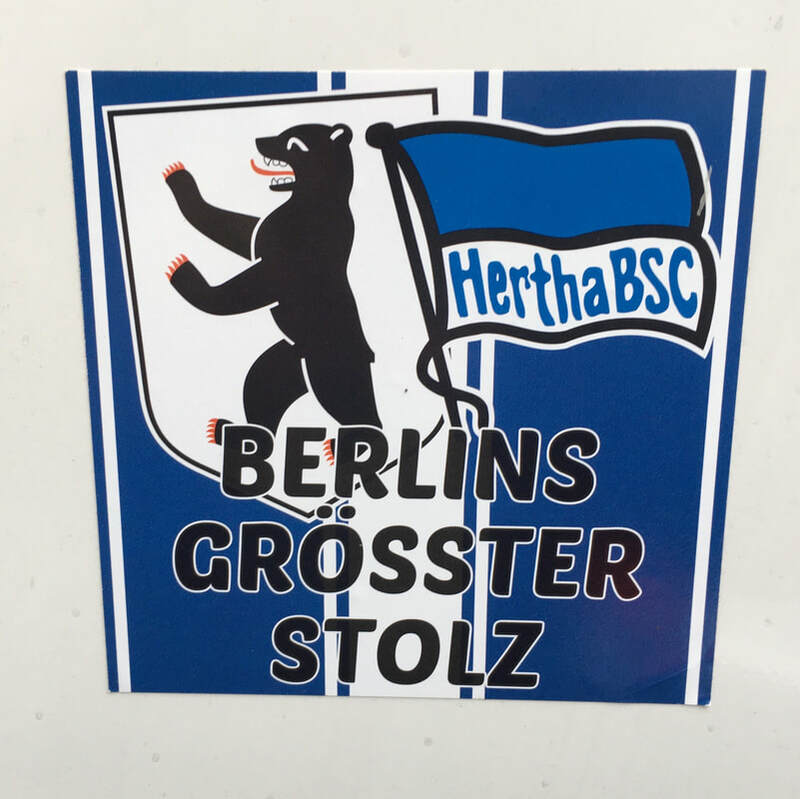 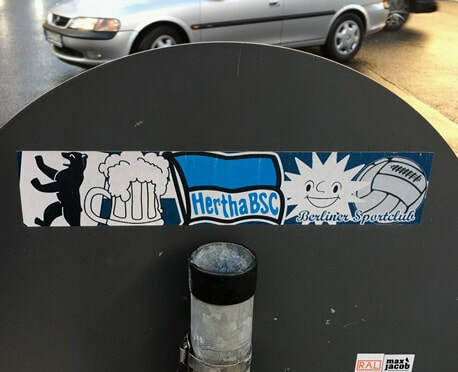 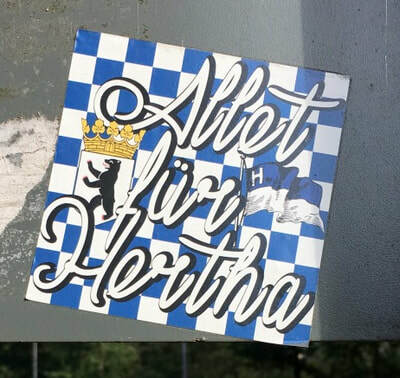 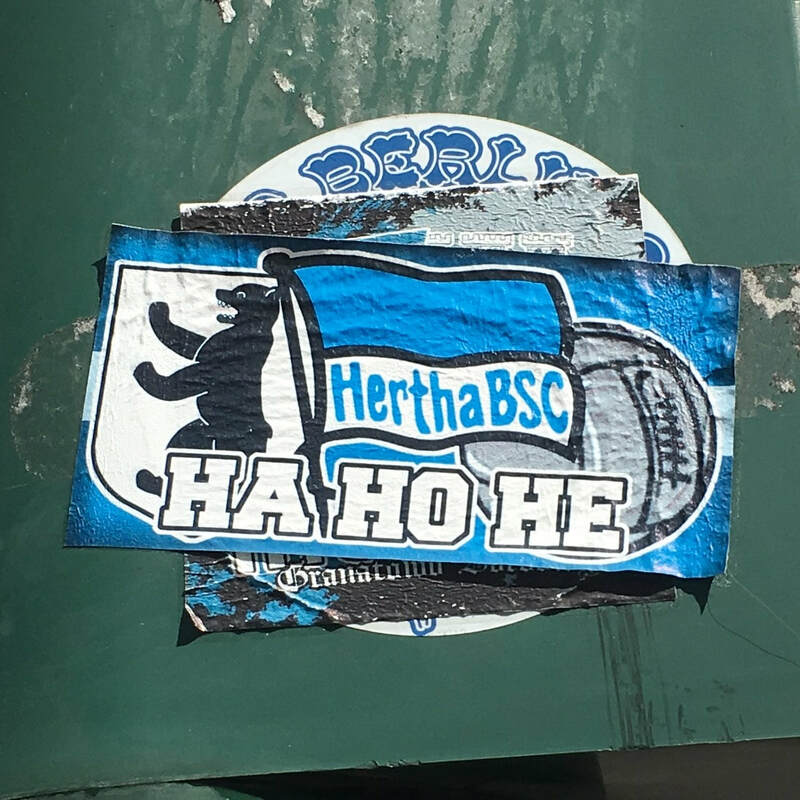 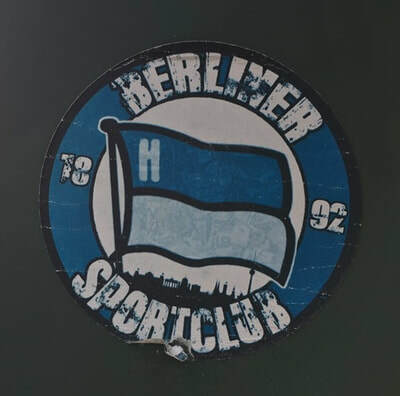 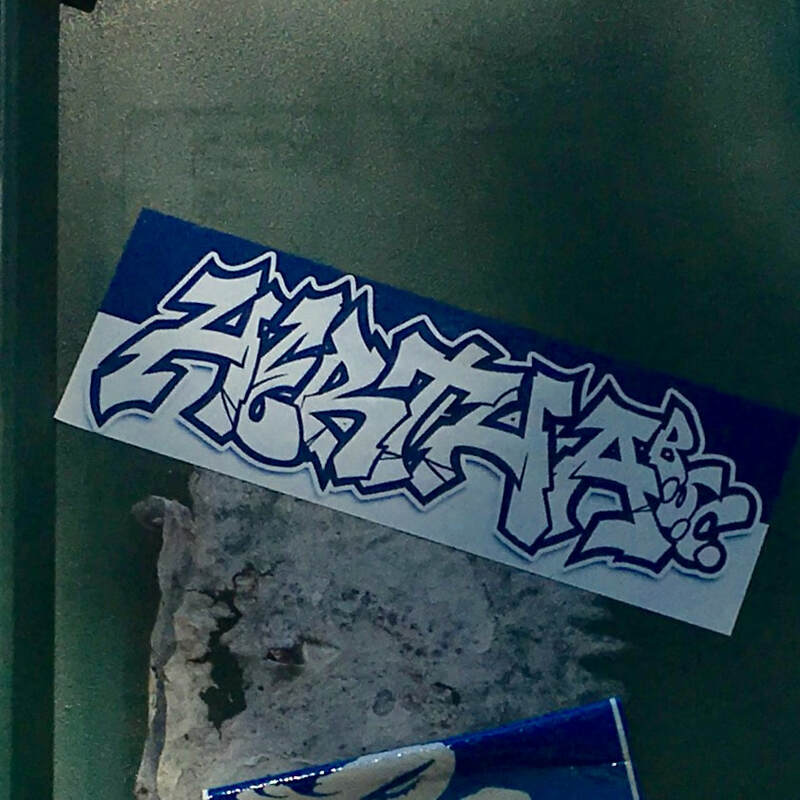 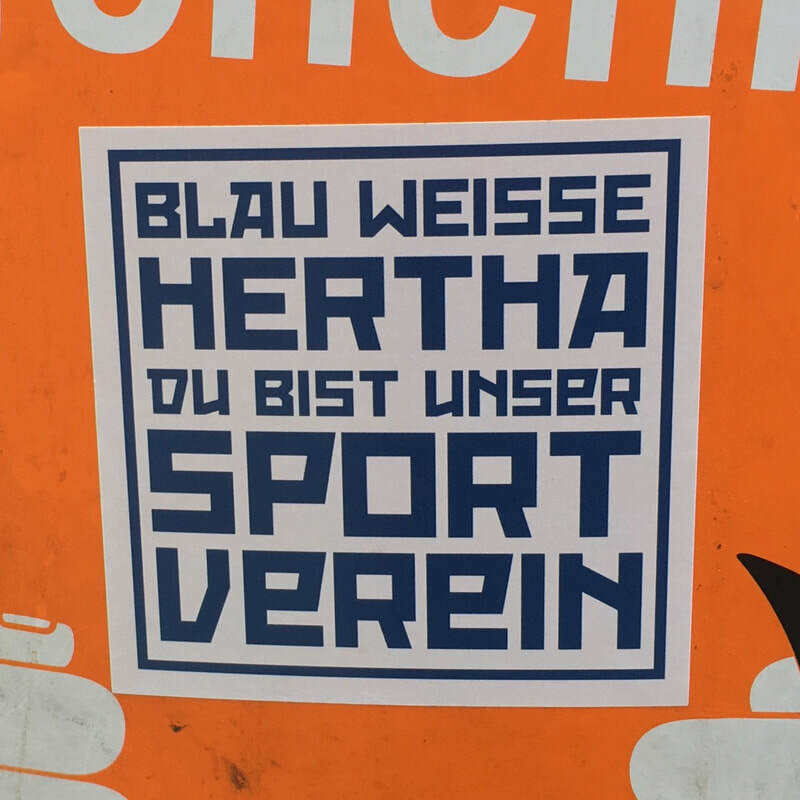 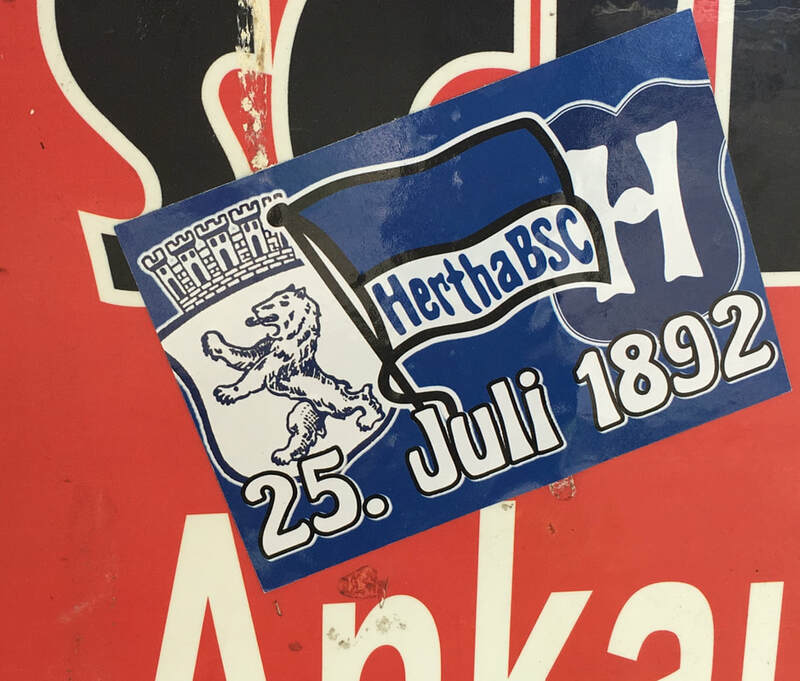 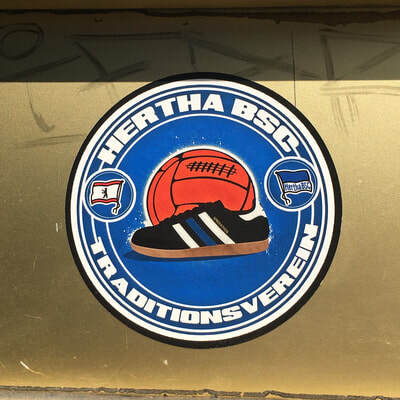 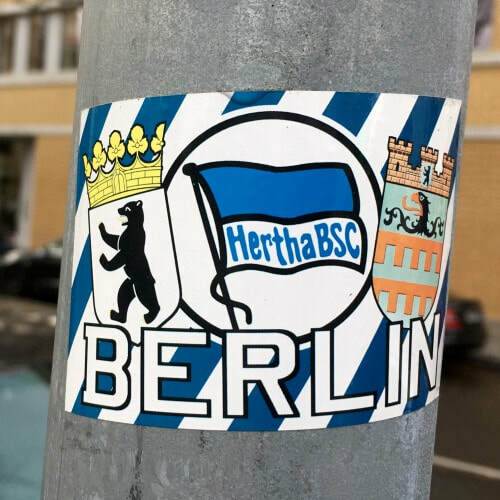 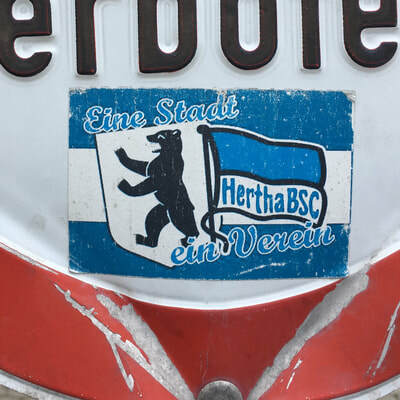 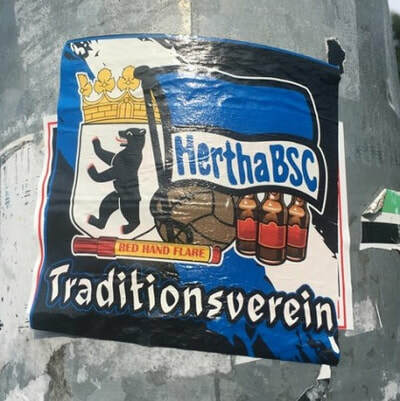 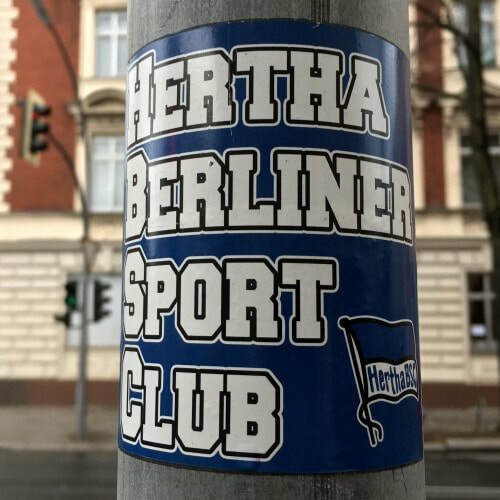 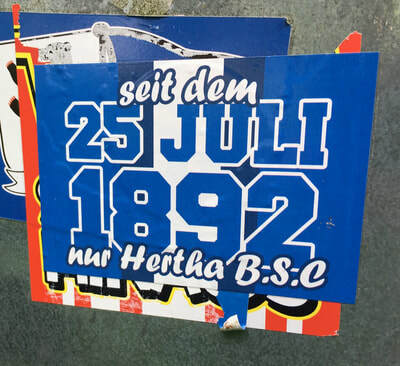 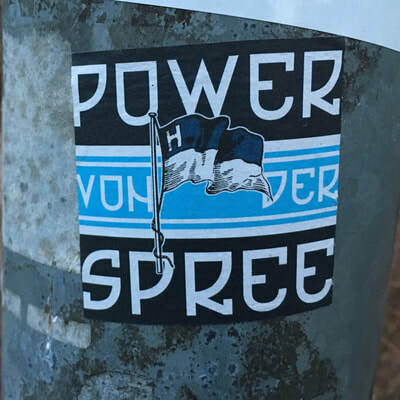 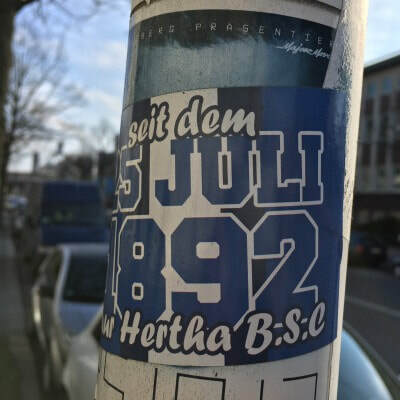 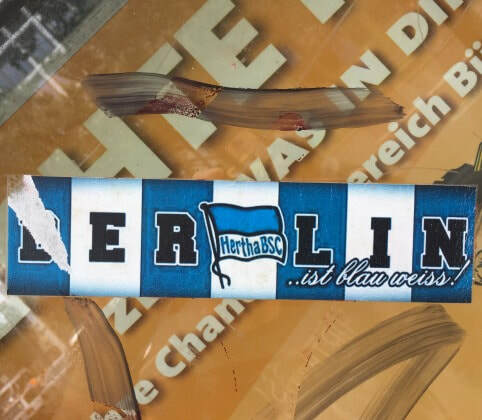 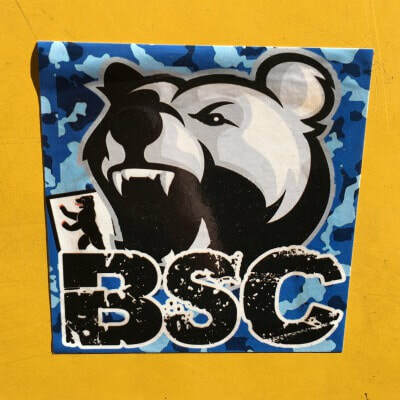 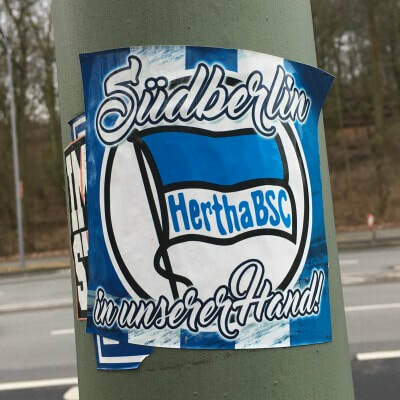 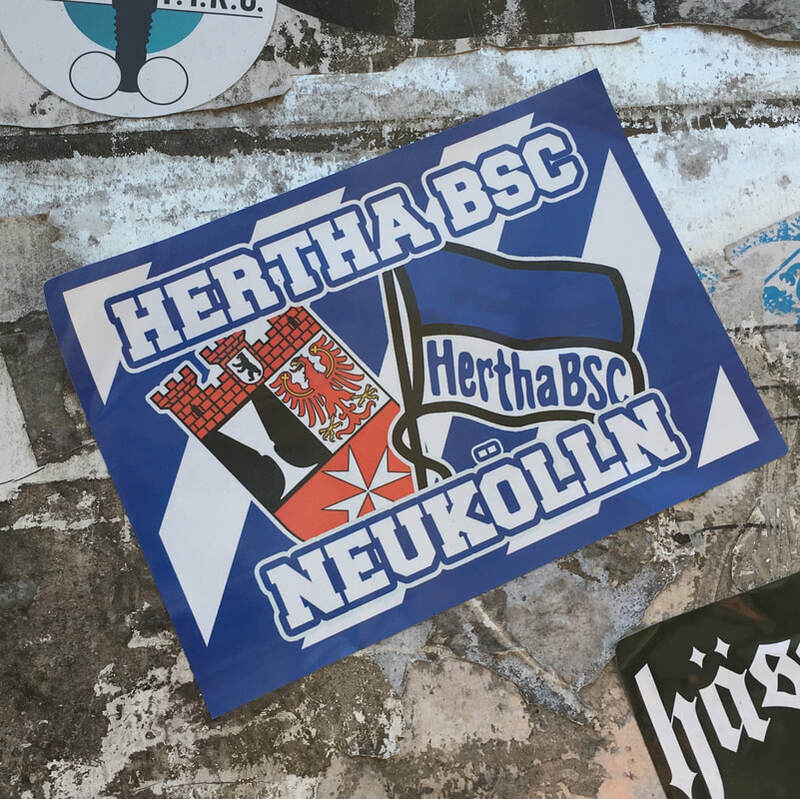 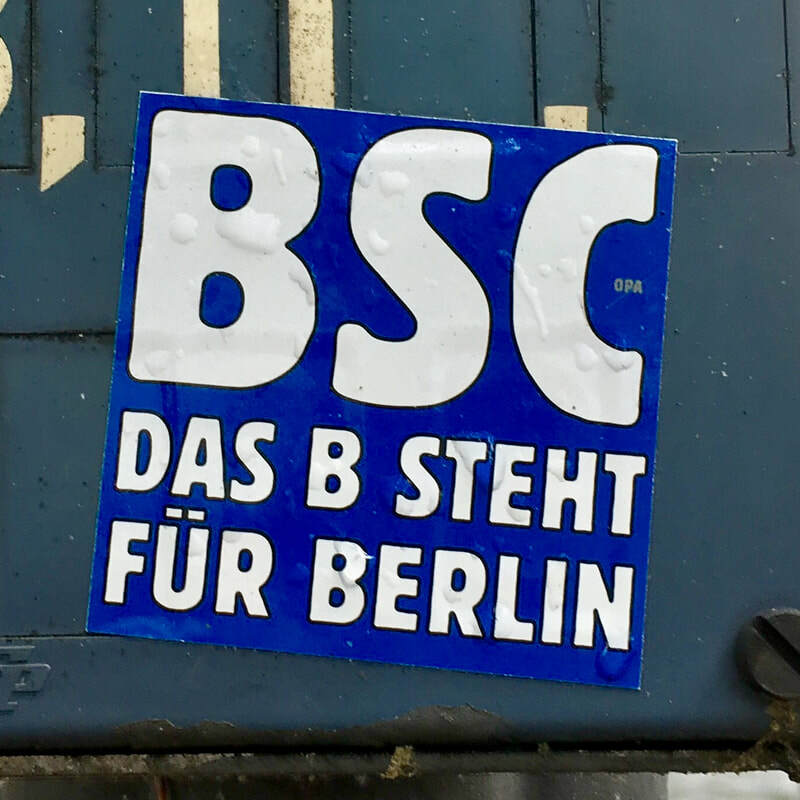 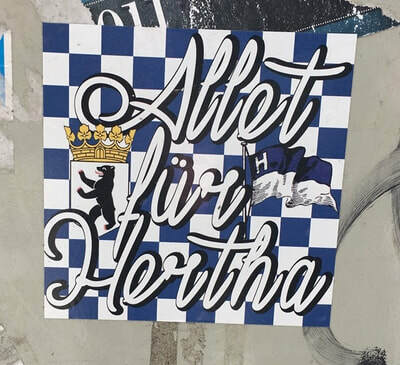 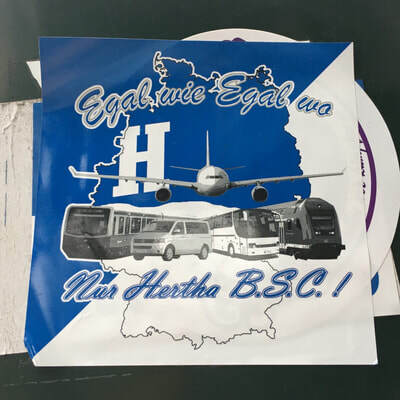 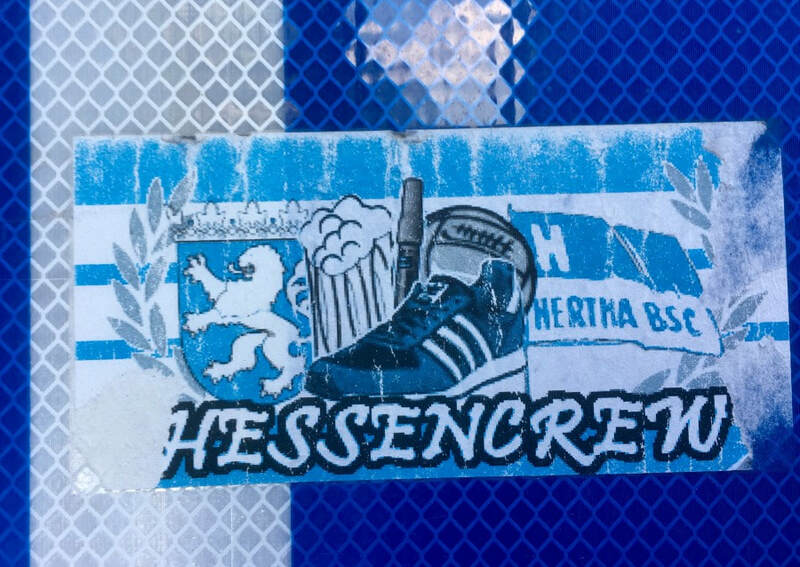 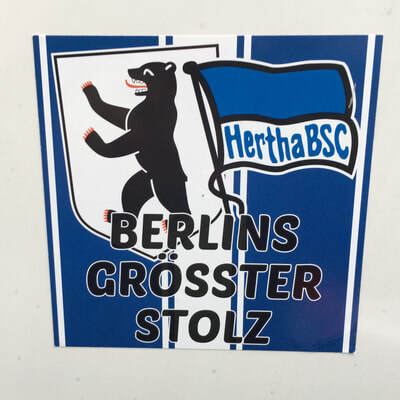 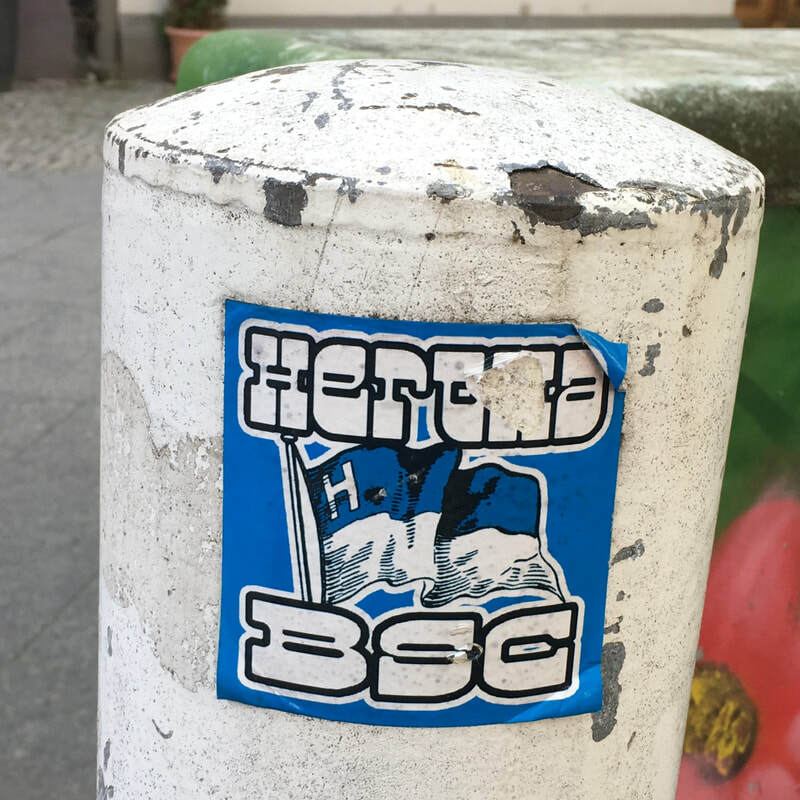 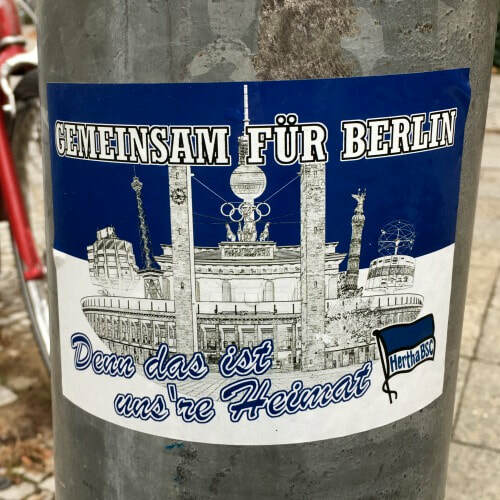 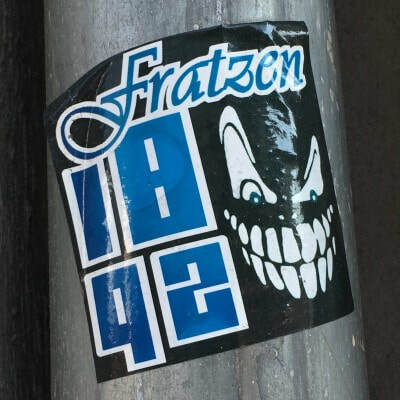 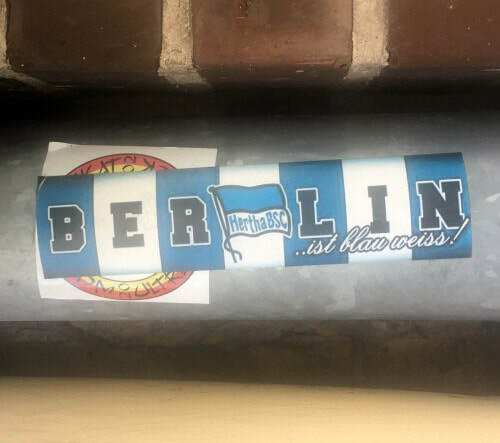 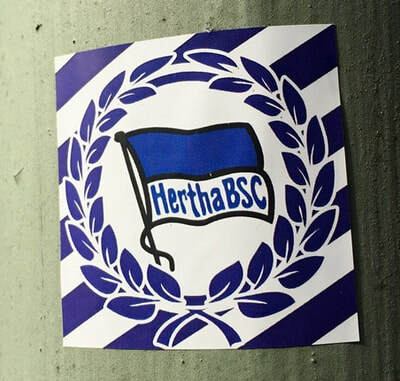 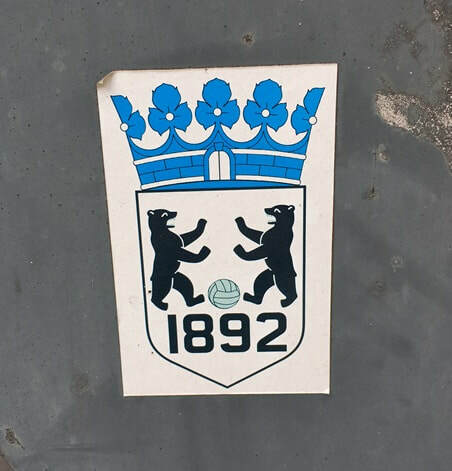 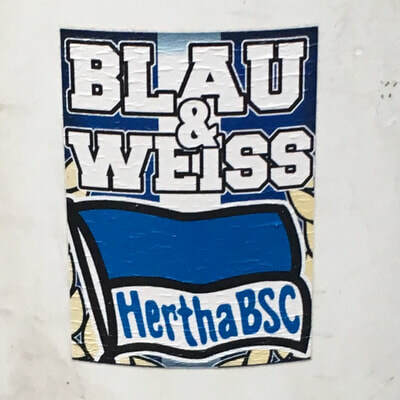 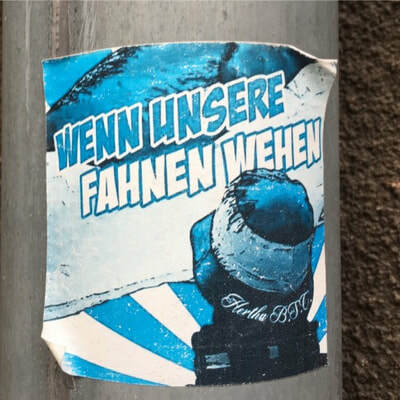 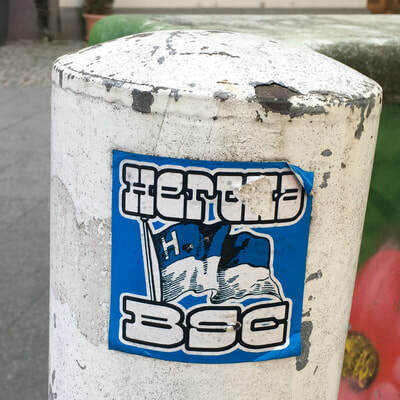 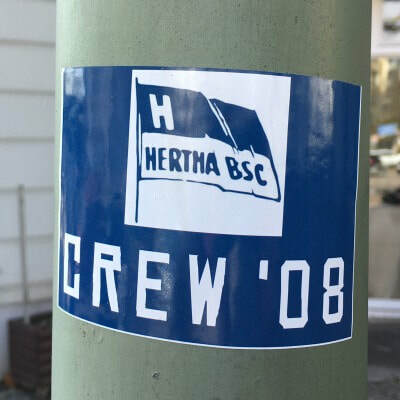 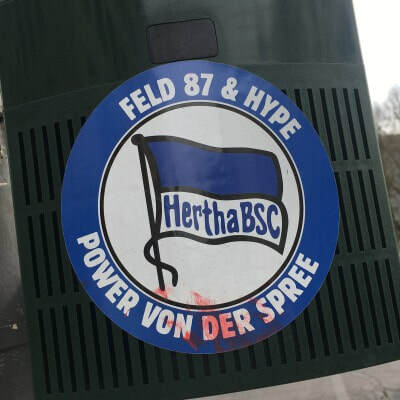 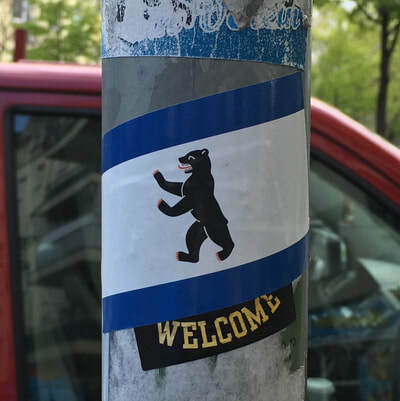 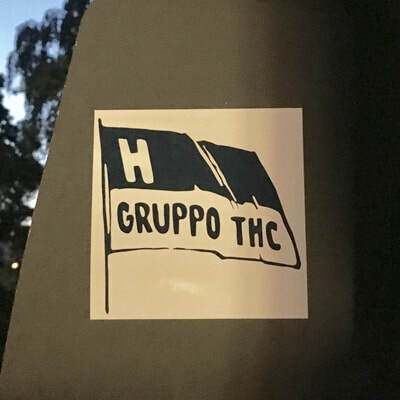 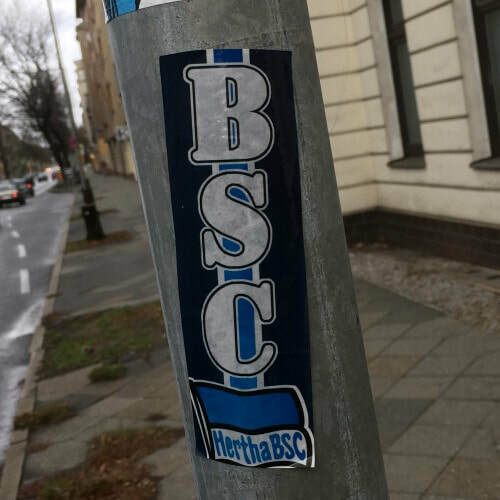 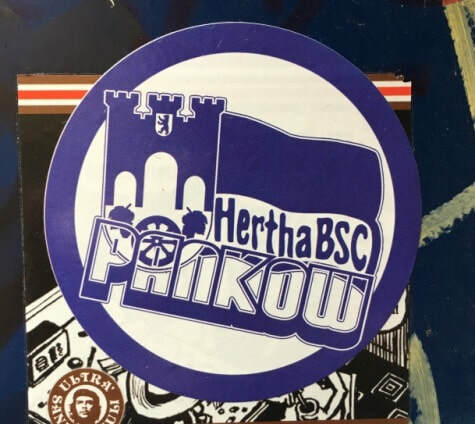 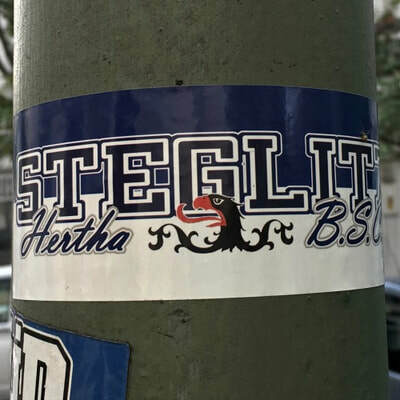 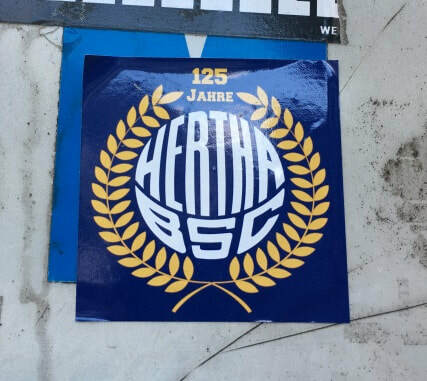 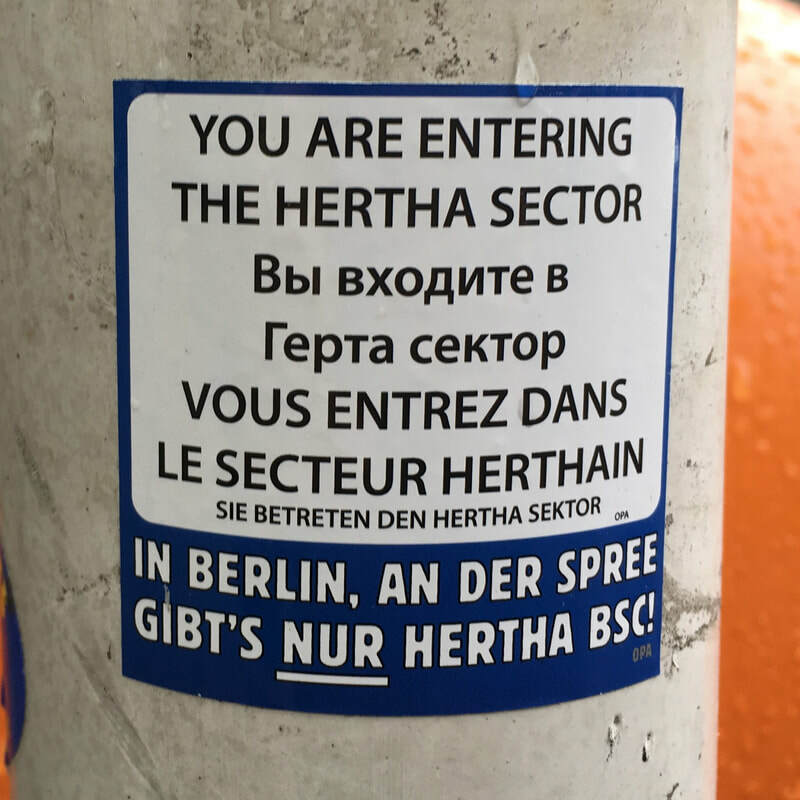 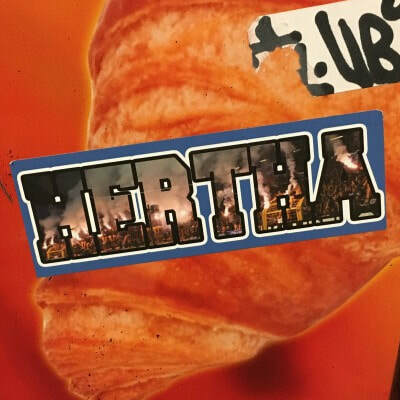 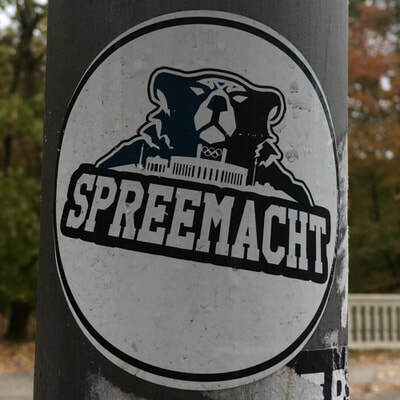 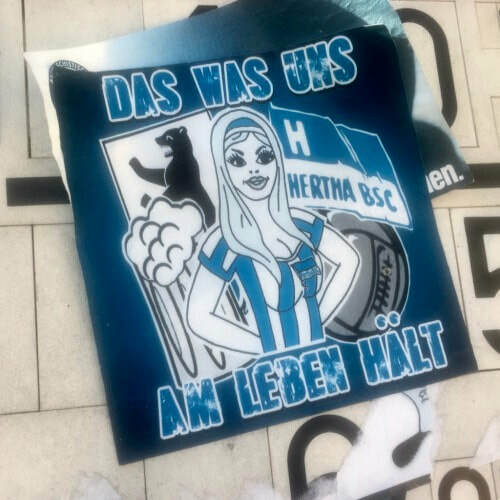 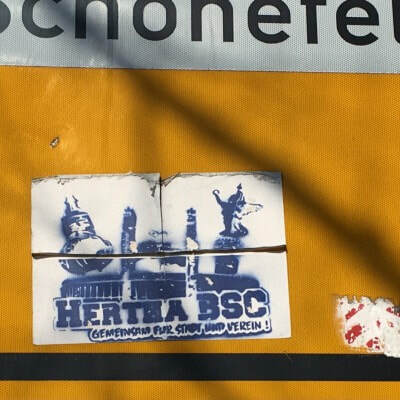 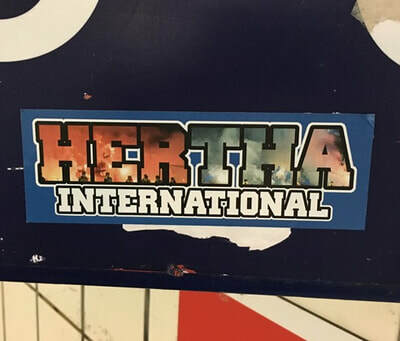 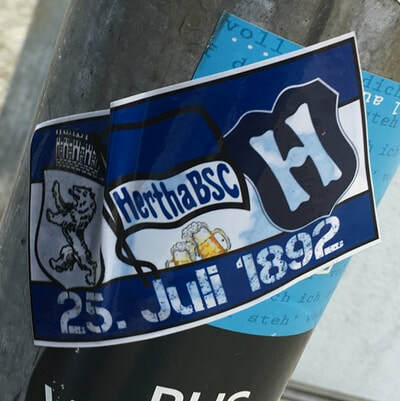 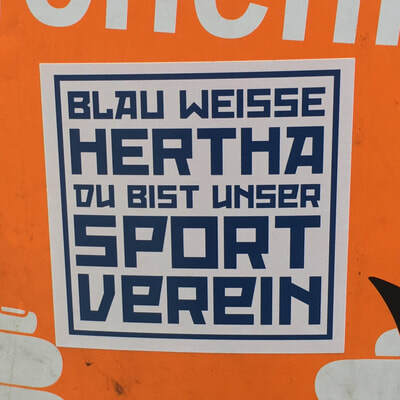 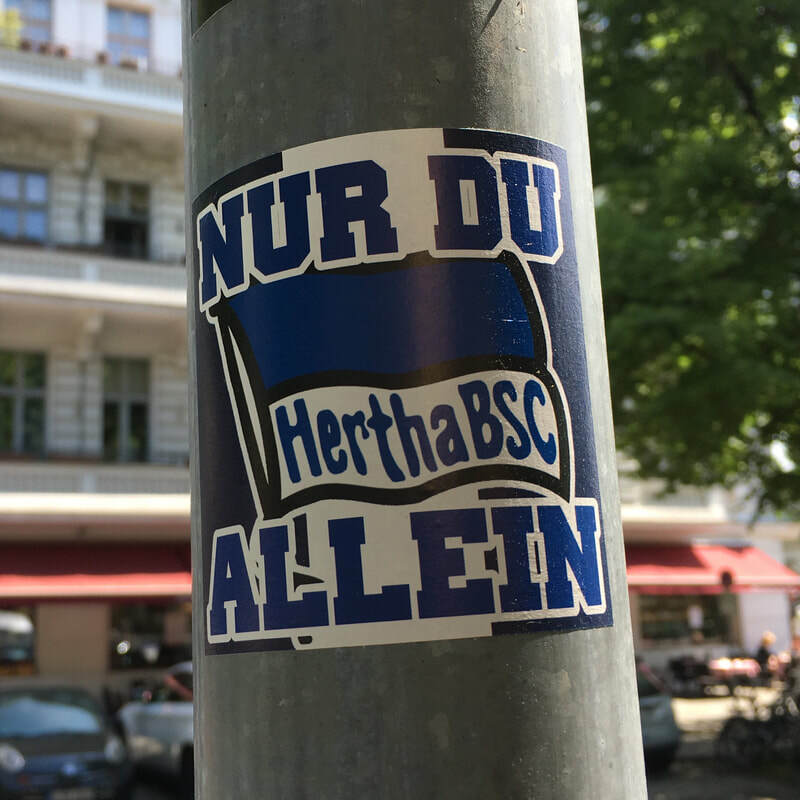 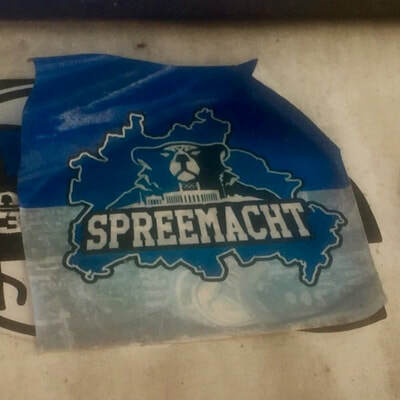 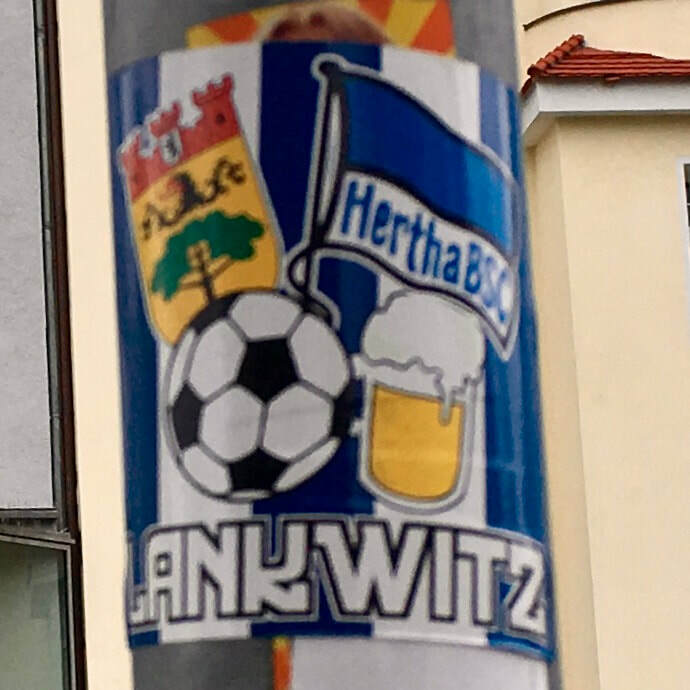 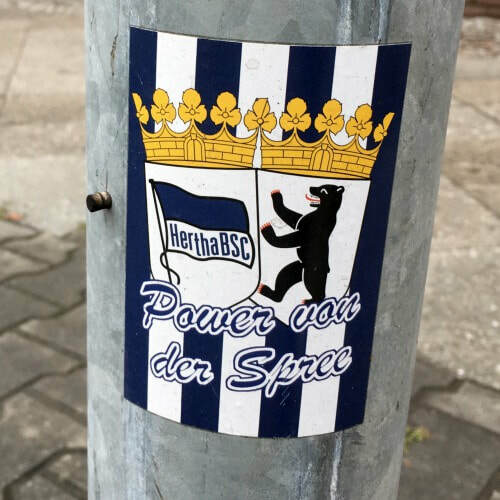 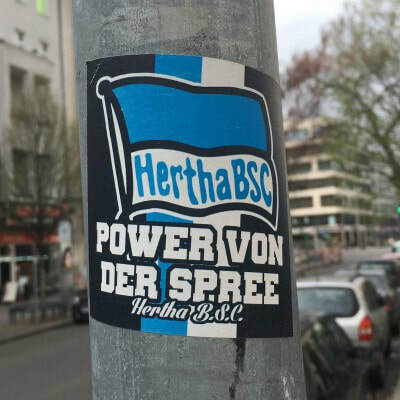 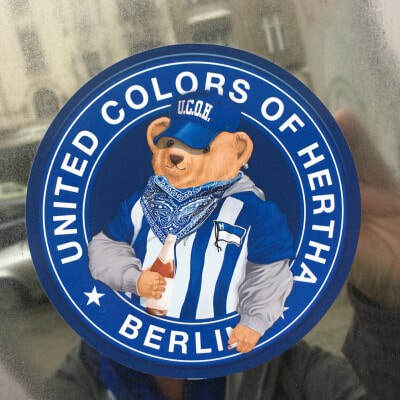 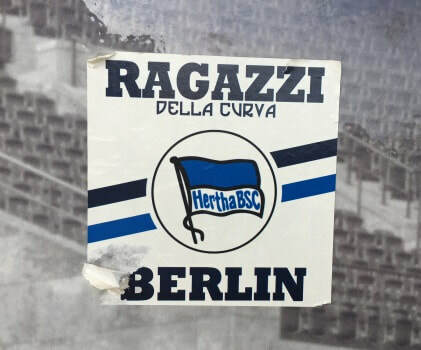 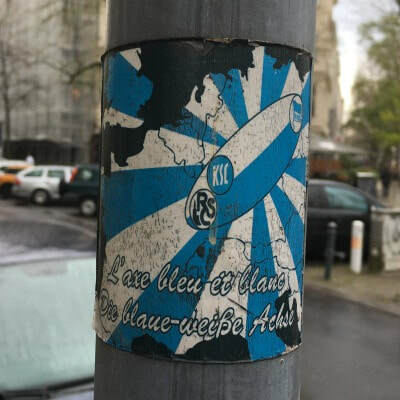 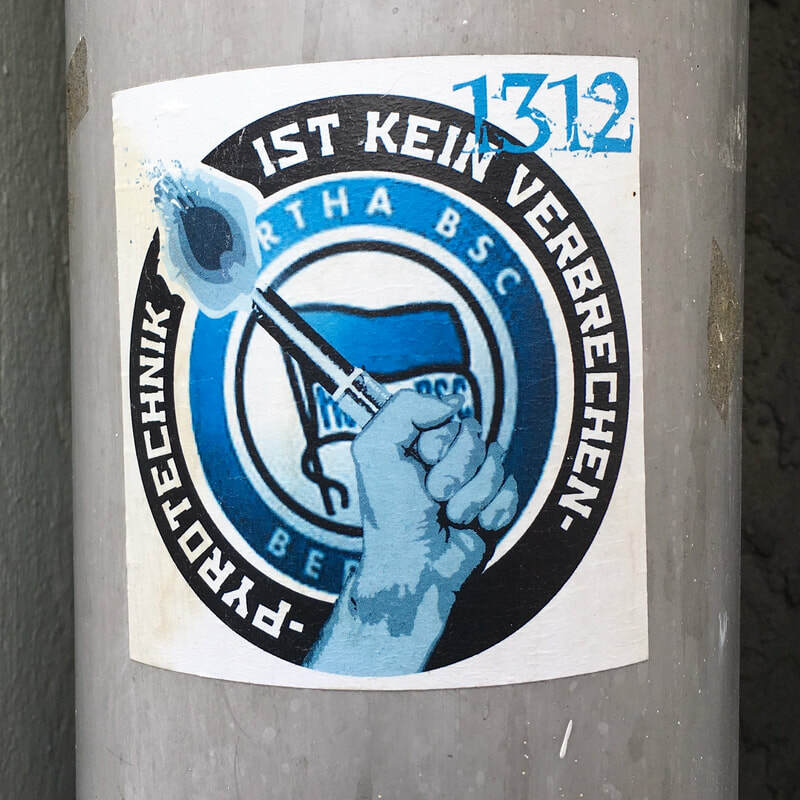 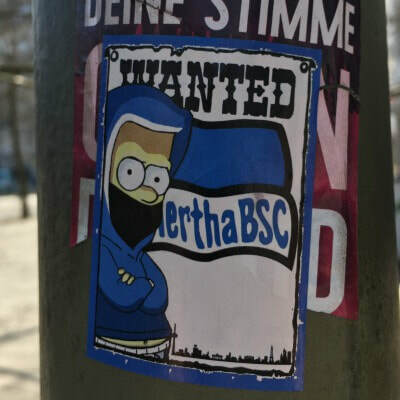 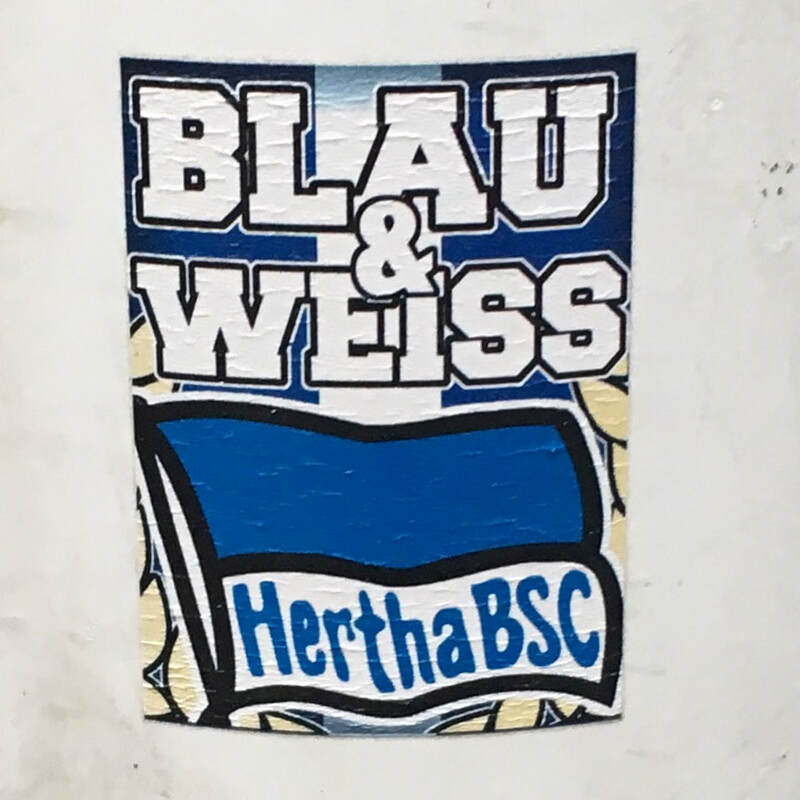 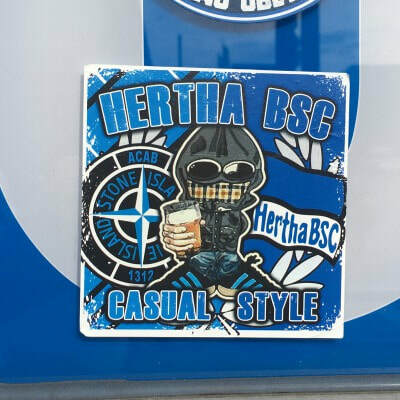 ​The slideshow below shows some of the Hertha stickers I have seen mostly in Berlin but also in Vienna, Bratislava, London and Brighton. 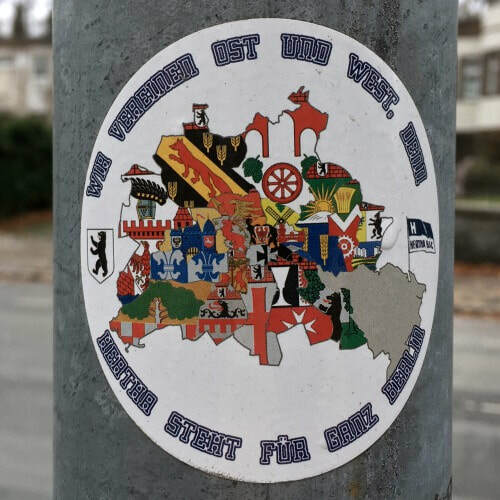 It is by no means comprehensive but it gives a flavour of what is going on and what can be seen if you care to look. There was I in my shirt and shorts as drizzle started to fall on fans standing outside at a bar before the game. I for one was hoping Pal Dardai’s plan for the game ran more smoothly than clothing choices for the day! 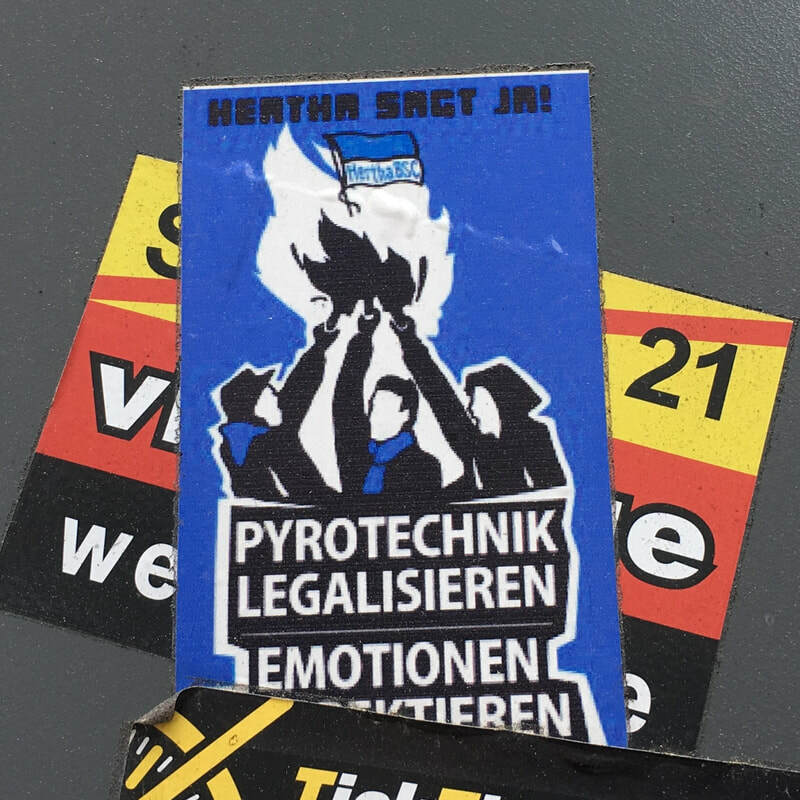 ​After a little pyro display from the listing Köln fans the game started well enough with an attacking formation of 4.4.2 with both Ibisevic and Selke up front. 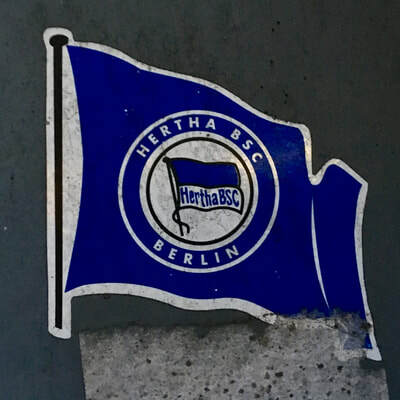 There were some early chances coming Hertha’s way with one in the opening seconds where Selke kicked the ball downwards and Kalou managed to get in a diving shot on the volley which was only saved by Timo Horn’s fingertips. 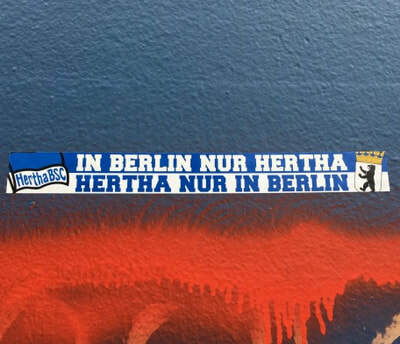 Then, just before the half hour mark, it was our hearts doing the Titanic again. 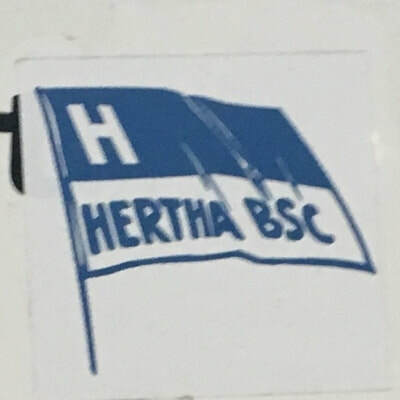 Positional errors and lack of speed from Mitchel Weiser saw Bittencourt onside and charging towards goal with our right back in pursuit. 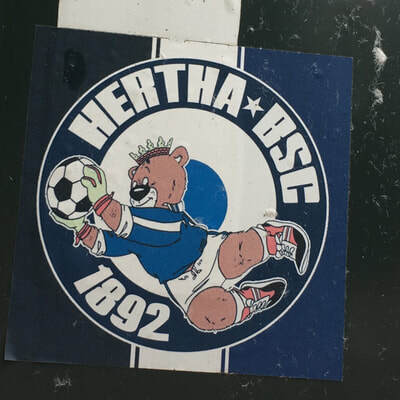 He didn’t make it in fact he came closer to taking out Jarstein and the ball ended up in out net. 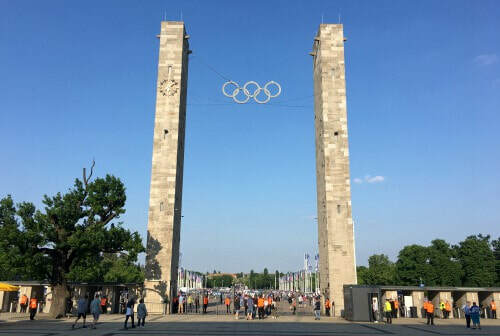 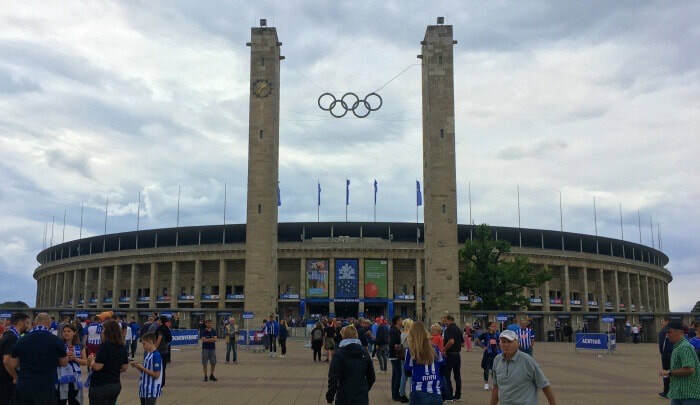 Both the team and the crowd were taken aback by this, even for Hertha, unexpected turn of events. 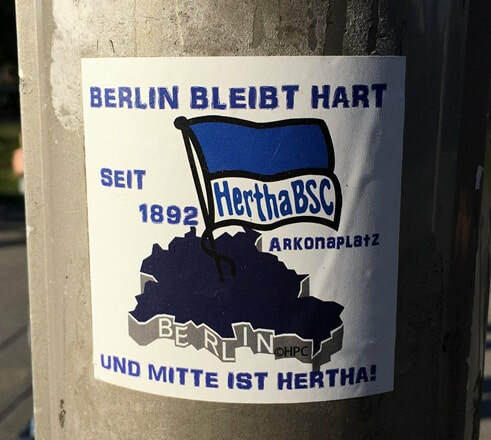 It took a while and the half time break to bring back Hertha fighting. The defensive mistake was replaced by Matthew Leckie and the feel of the game changed from the subdued period before half time. 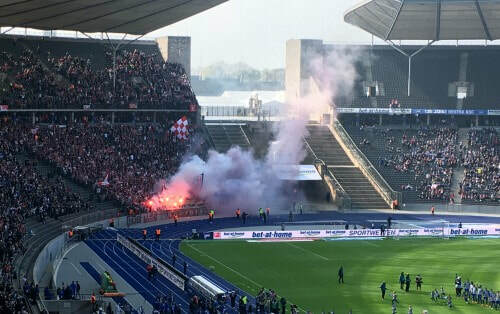 The breakthrough came just a few minutes after the restart in the 49th minute when a poor clearance from the Köln defence fell to Marvin Plattenhardt who crossed the ball to the goal starved Davie Selke who crashed the ball into the net breaking what was by now a 716 minute goal drought. 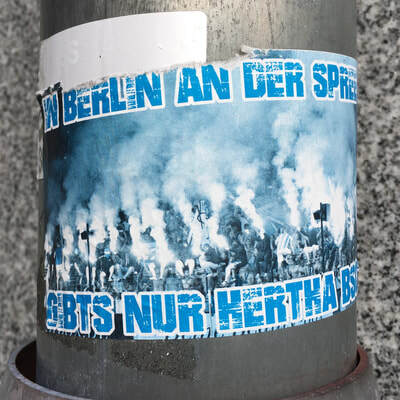 Relief and jubilation in equal measure spread through the crowd like a forest fire in pure Oxygen. The second and ultimately the winning goal followed a similar format with Plattenhardt putting in a cross and Selke being there to confidently put it away to claim a brace for the club and secure Hertha’s 1000th home goal with one swing of the boot. 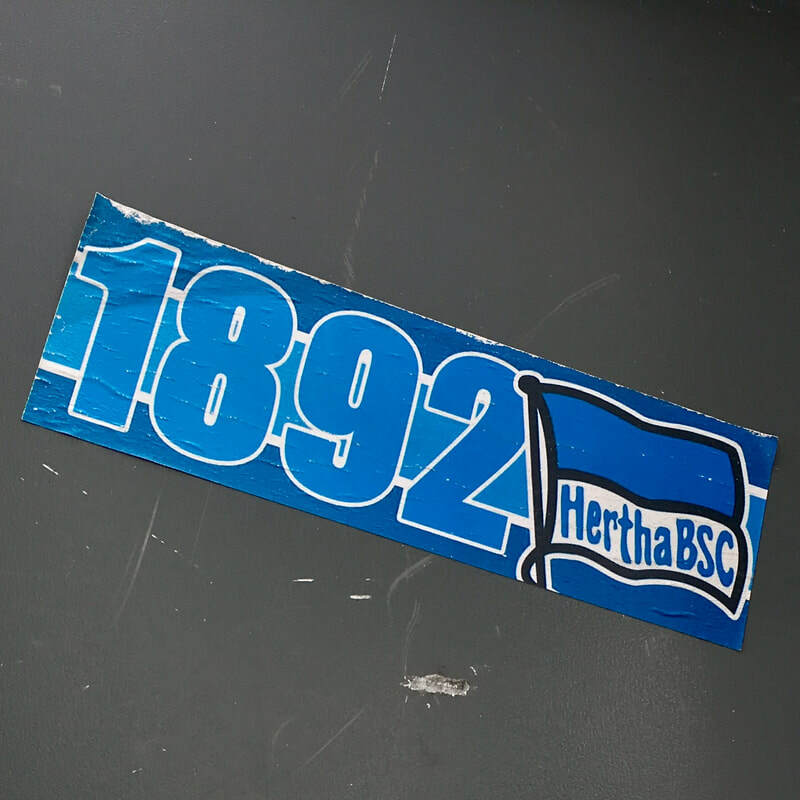 Here we were in mid April and this was the first home victory of 2018 and 122 days. 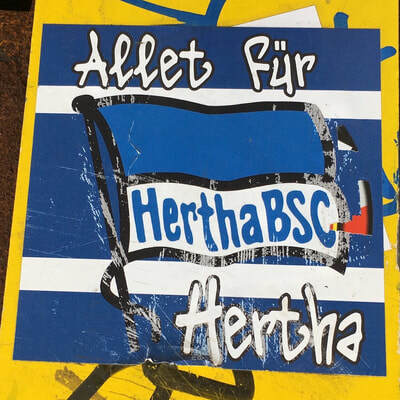 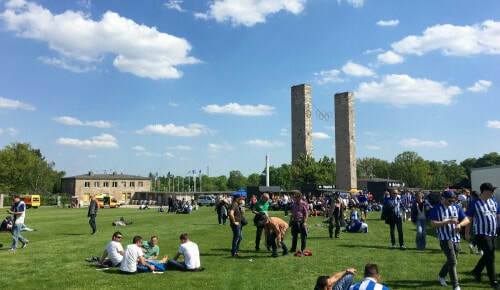 Hertha fans are patient souls, they have to be. 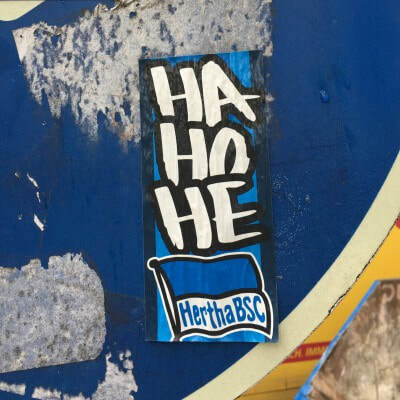 So, Davie Selke said he would score against Köln before the game and he was true to his word. 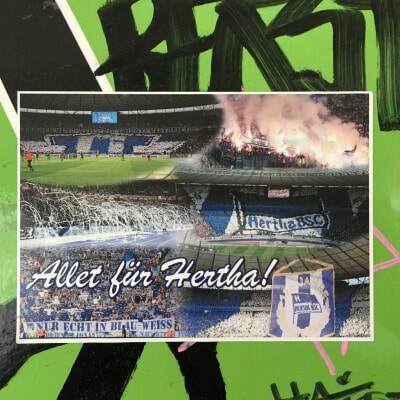 A short video clip showing the support firstly before the game and then afterwards when fans and team celebrate the long anticipated home victory. 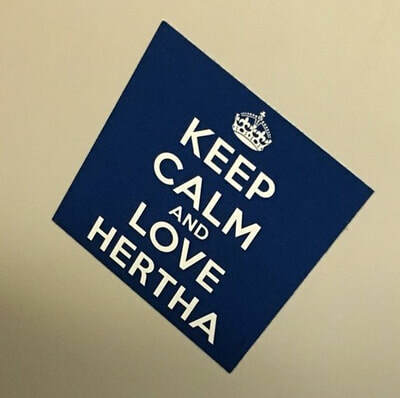 Just a bit of fun with time lapse filming after the game . 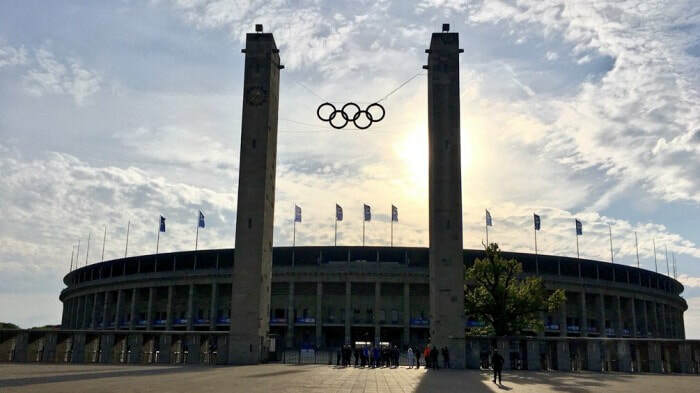 . .
Another day and another match saw Hertha returns to the Olympiastadion on a damp, dark night to face the visiting VfL Wolfsburg an match day 28. 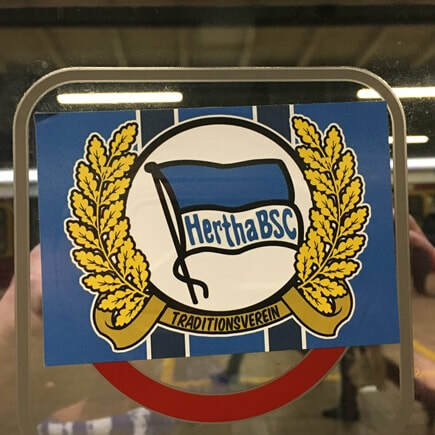 The goal drought discussed in my last post was long over thanks to the points provider in Hamburg as a result fans were looking forward to some entertainment and hopefully some more points. The weather made it a pretty miserable night to be honest and kicking off at 20:30 hours on Easter weekend did little to help the turnout. 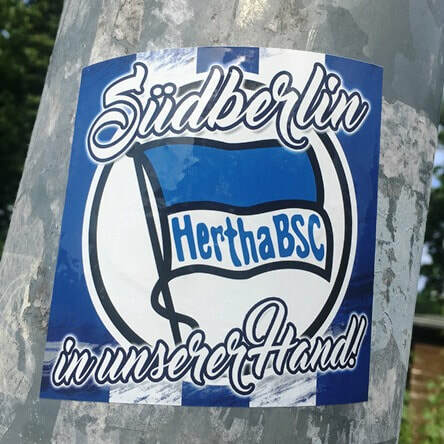 A shade under 35,000 made it to the stadium to support Hertha which left a few echos rattling around the Olympiastadion but the kurve still sang and did their thing. 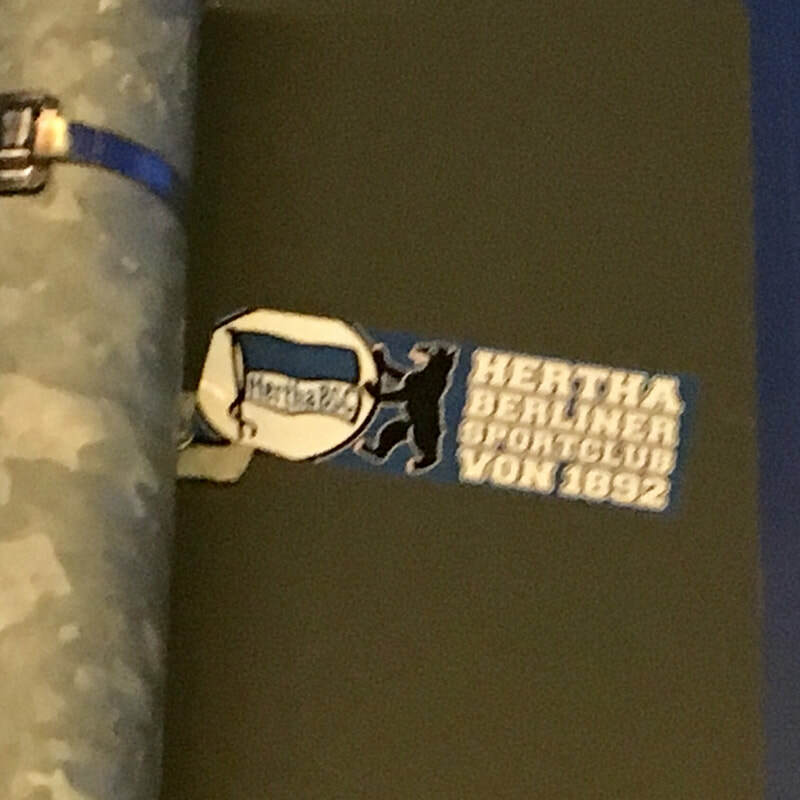 On the night the Old Lady started with a 4231 formation with Vedad Ibesivic up front. 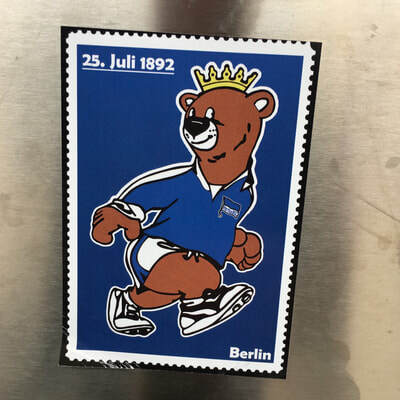 It wasn’t all bad and I don’t recall Rune Jarstein being seriously challenged although he came scarily close to gifting the visitors a goal. 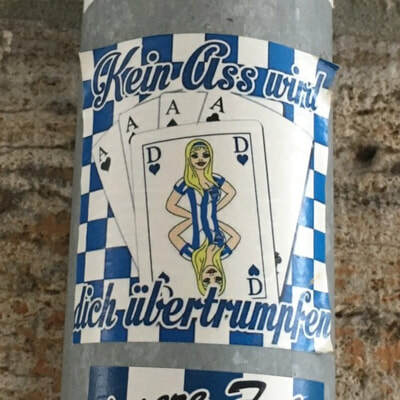 With what would have been a real shocker had he not recovered the situation in the last second. There were some nice passages of play with passes being strung together and some great pieces of individual skill from the likes of Leckie and Maier. 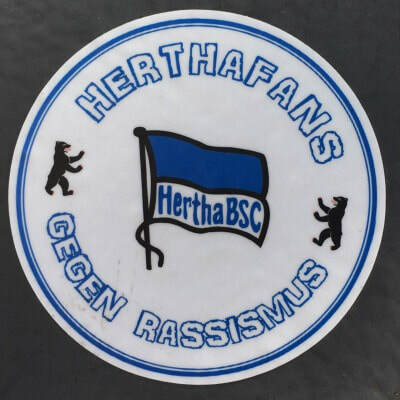 However some of the long ball passes went woefully astray including some clangers from Maxi Mittelstädt that killed any possibility of a successful attack/counterattack. 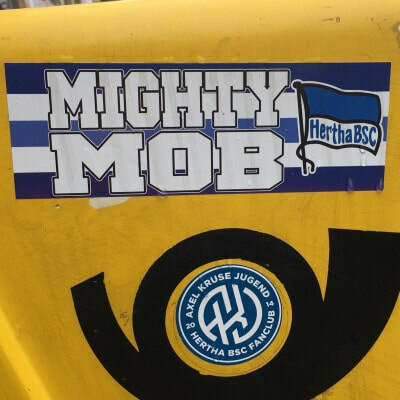 It appeared the team were missing the input from Plattenhardt and Lazaro. 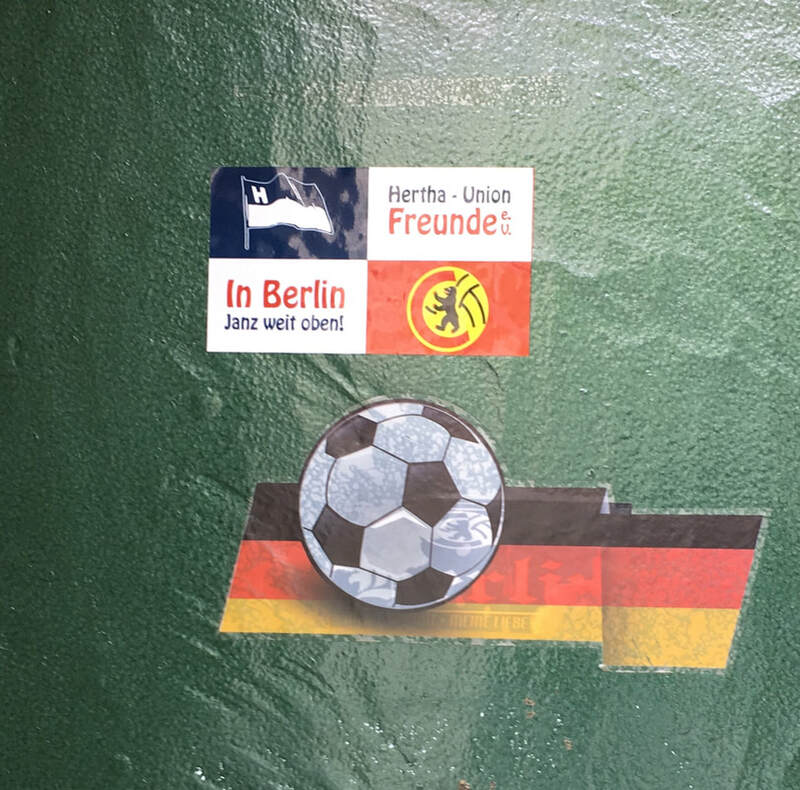 It was not the most impressive game I had ever witnessed I think it’s fair to say. You never know who’s going to turn up when Hertha come out to play. 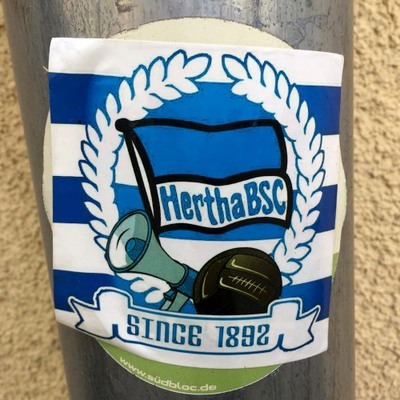 The long awaited end to the goal drought during the Hamburger SV away game (448 minutes) with goals from Lazaro (voted Bundesliga “Rookie of the month” for March) and Kalou did not result in Hertha raining goals. 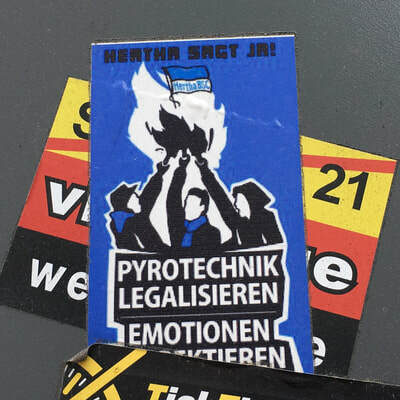 The one saving grace of this goalless, dark, wet rather miserable night was the fact it was “supplemented” by a little pyro display put on by the visiting supporters. 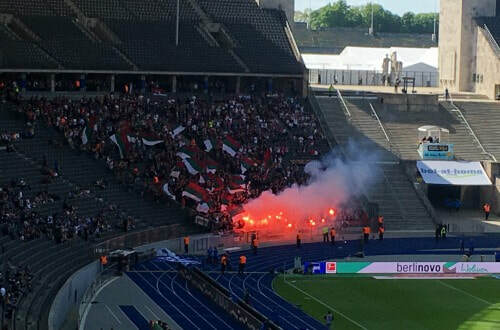 I guess they wanted to block out the superior support in the Ostkurve with the smoke. 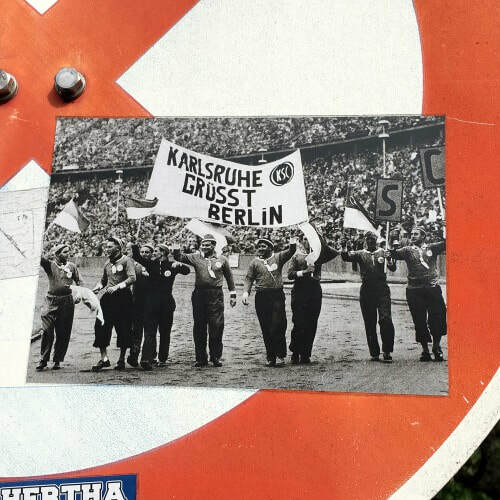 A few photos as a picture paints a thousand words . . . or so they say.